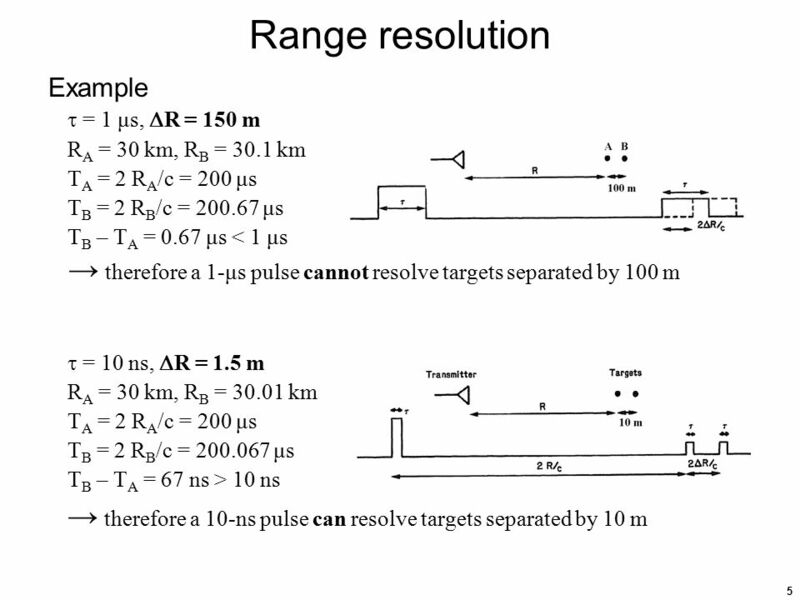 The ability to resolve targets is somewhat subjective. 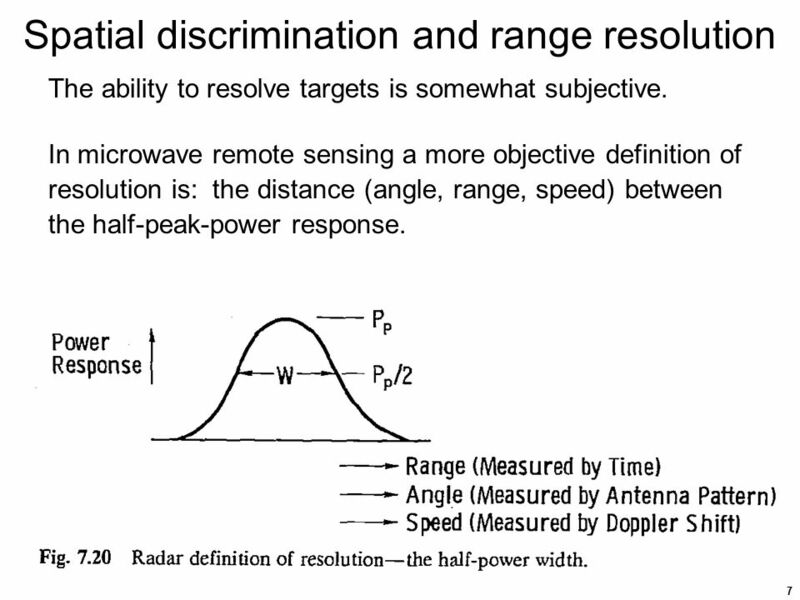 In microwave remote sensing a more objective definition of resolution is: the distance (angle, range, speed) between the half-peak-power response. 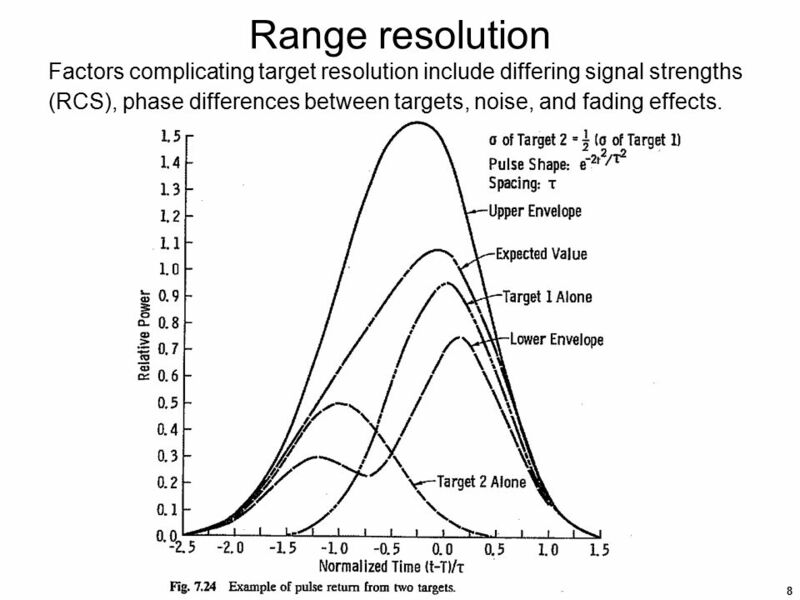 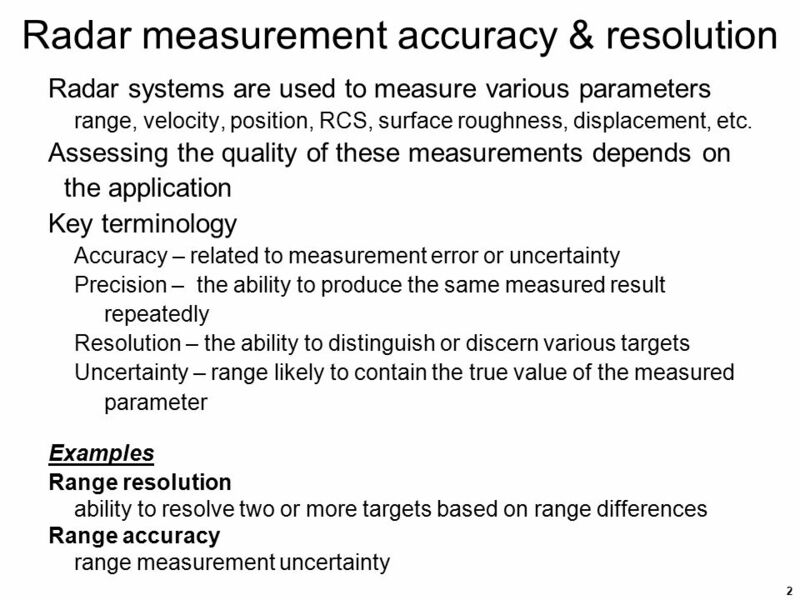 8 Range resolution Factors complicating target resolution include differing signal strengths (RCS), phase differences between targets, noise, and fading effects. 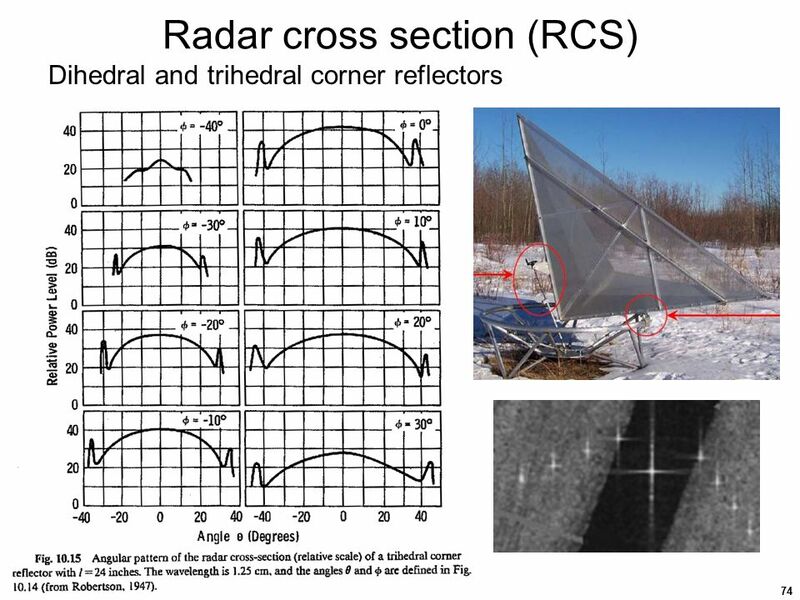 10 Range resolution The radar’s ability to discriminate between targets at different ranges, its range resolution, R or r, is inversely related to the signal bandwidth, B. where c is the speed of light in the medium. 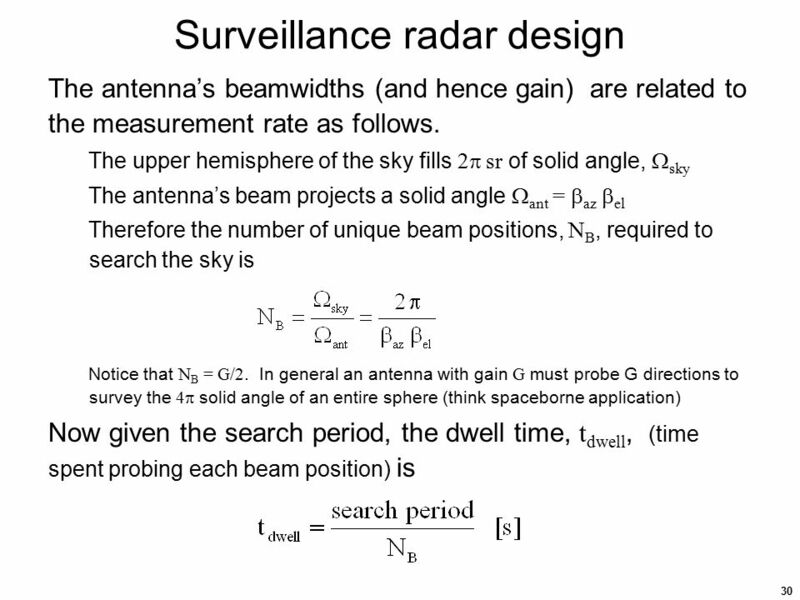 The bandwidth of the received signal should match the bandwidth of the transmitted signal. 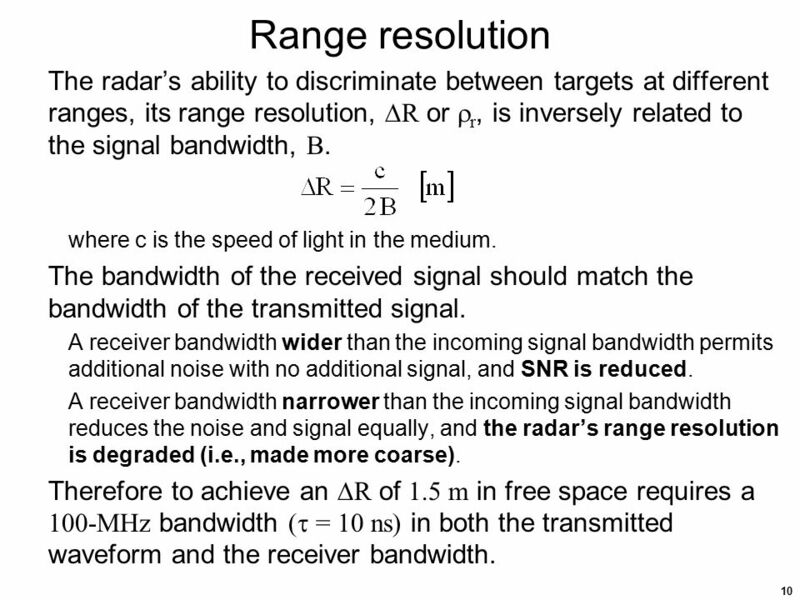 A receiver bandwidth wider than the incoming signal bandwidth permits additional noise with no additional signal, and SNR is reduced. 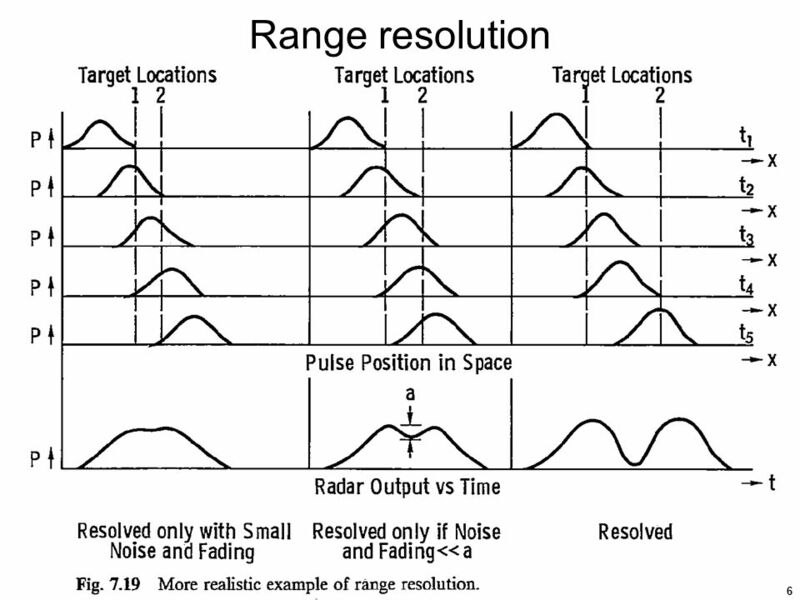 A receiver bandwidth narrower than the incoming signal bandwidth reduces the noise and signal equally, and the radar’s range resolution is degraded (i.e., made more coarse). 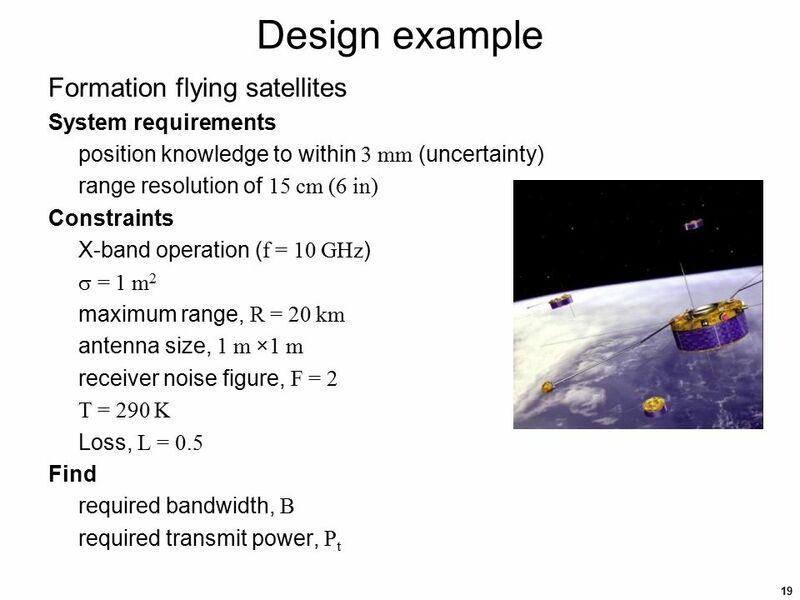 Therefore to achieve an R of 1.5 m in free space requires a 100-MHz bandwidth ( = 10 ns) in both the transmitted waveform and the receiver bandwidth. 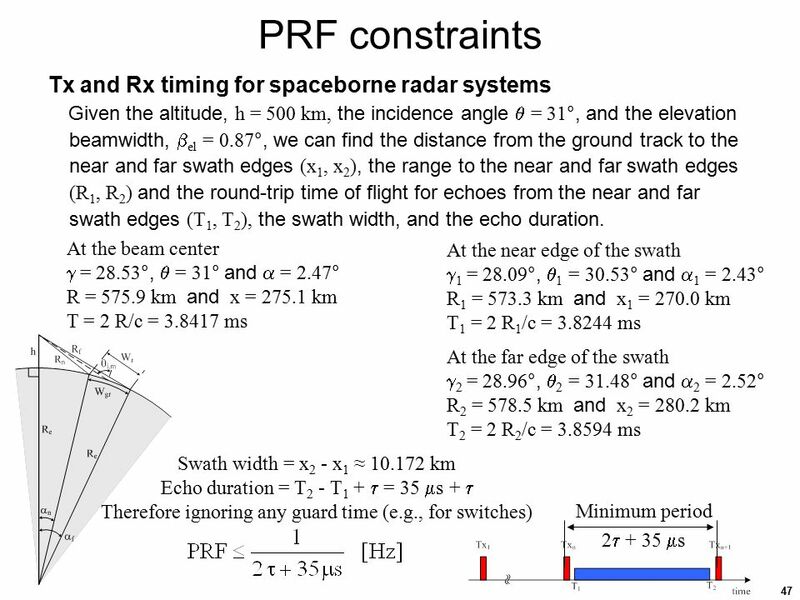 need to find the SNR for R = 1852 m SNR = Pt Gt Gr  2 L / [(4)3 R4 PN] Pt (55 kW)	77 dBm Gt·Gr	90 dBi 	10 dBsm 2	-30 dBsm L	-5 dB (4) dB R dB m4 PN dBm SNR	79 dB or 80  106 Range accuracy, R R = R / (2 SNR) = 0.5 / (2 × 80 × 106) = 1 mm The realizable range accuracy depends on the processing algorithm. 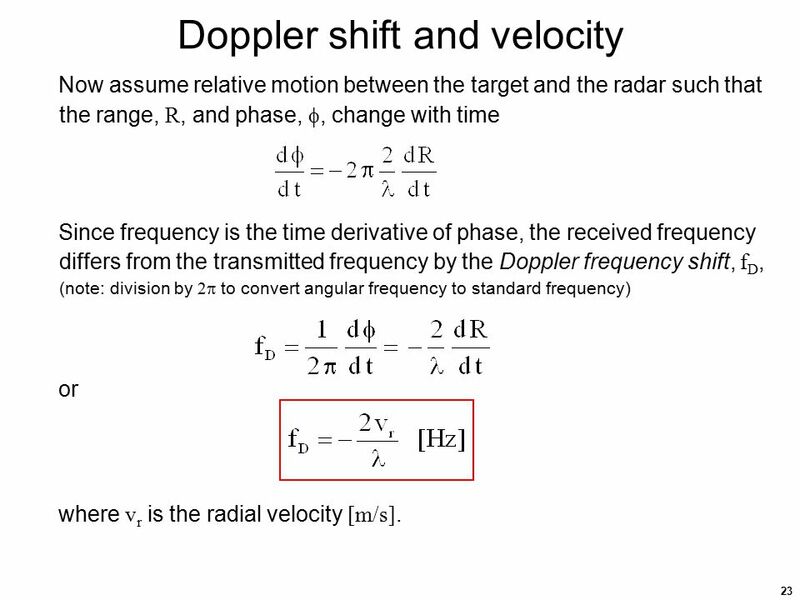 Now assume relative motion between the target and the radar such that the range, R, and phase, , change with time Since frequency is the time derivative of phase, the received frequency differs from the transmitted frequency by the Doppler frequency shift, fD, (note: division by 2 to convert angular frequency to standard frequency) or where vr is the radial velocity [m/s]. 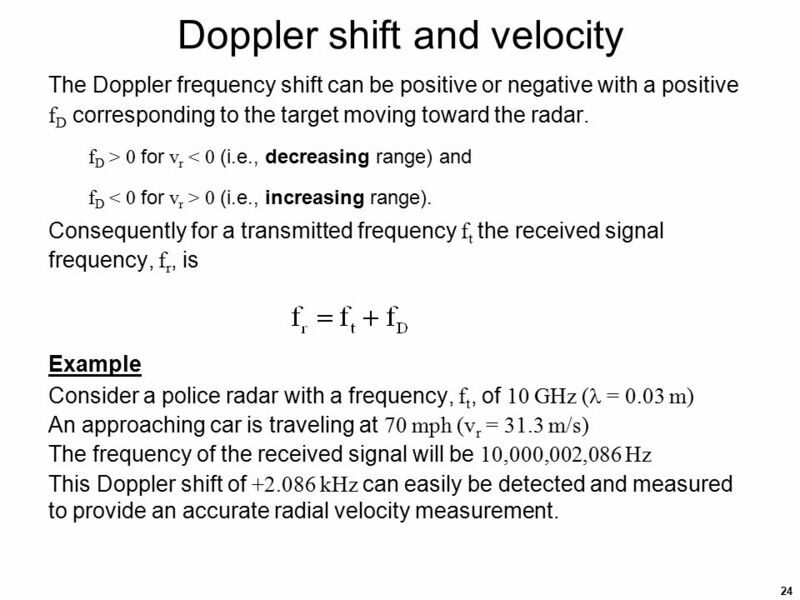 The Doppler frequency shift can be positive or negative with a positive fD corresponding to the target moving toward the radar. 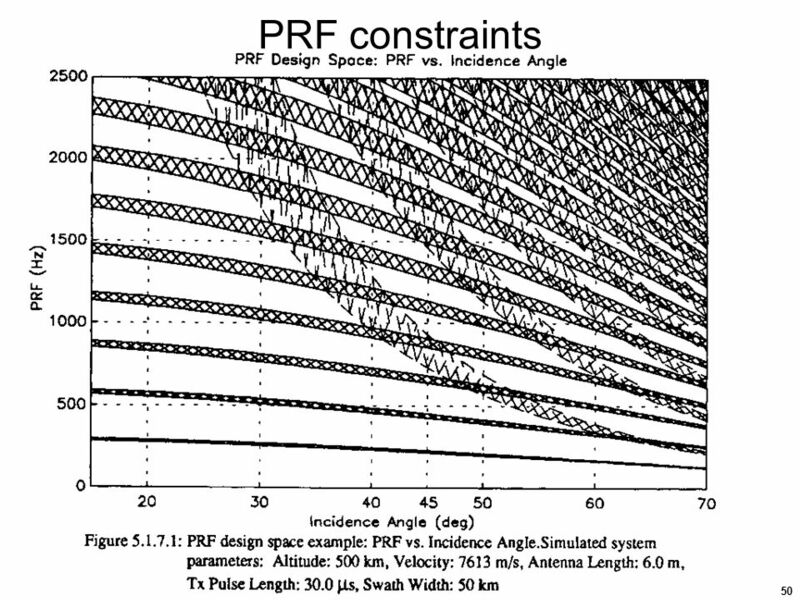 fD > 0 for vr < 0 (i.e., decreasing range) and fD < 0 for vr > 0 (i.e., increasing range). 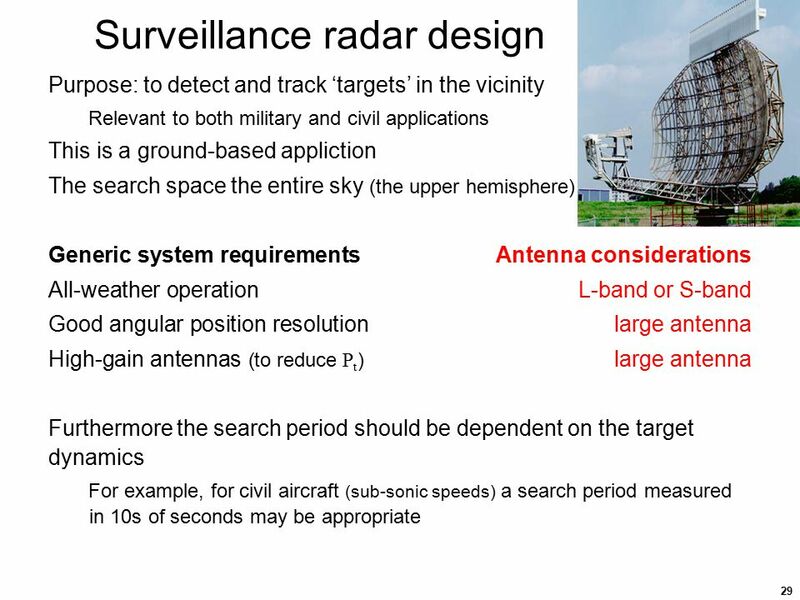 Consequently for a transmitted frequency ft the received signal frequency, fr, is Example Consider a police radar with a frequency, ft, of 10 GHz ( = 0.03 m) An approaching car is traveling at 70 mph (vr = 31.3 m/s) The frequency of the received signal will be 10,000,002,086 Hz This Doppler shift of kHz can easily be detected and measured to provide an accurate radial velocity measurement. 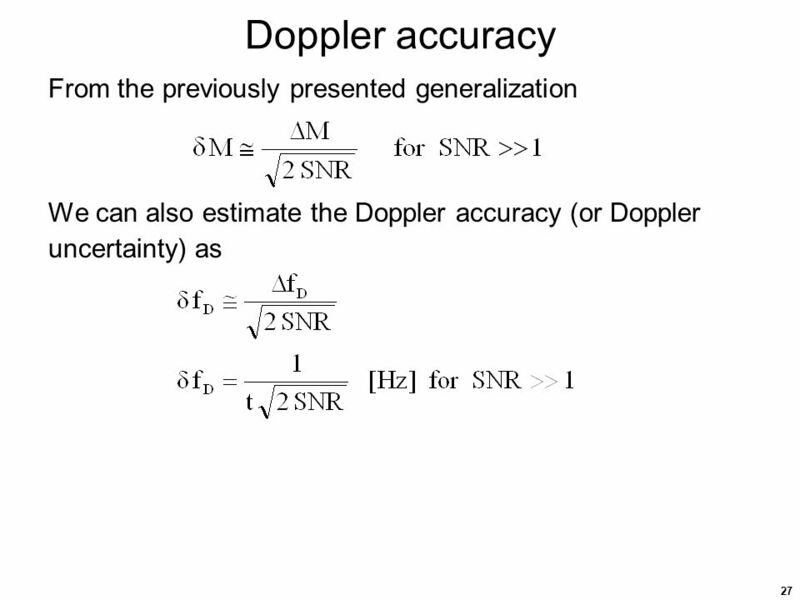 26 Doppler resolution Doppler frequency resolution pertains to the ability to resolve two frequency tones. 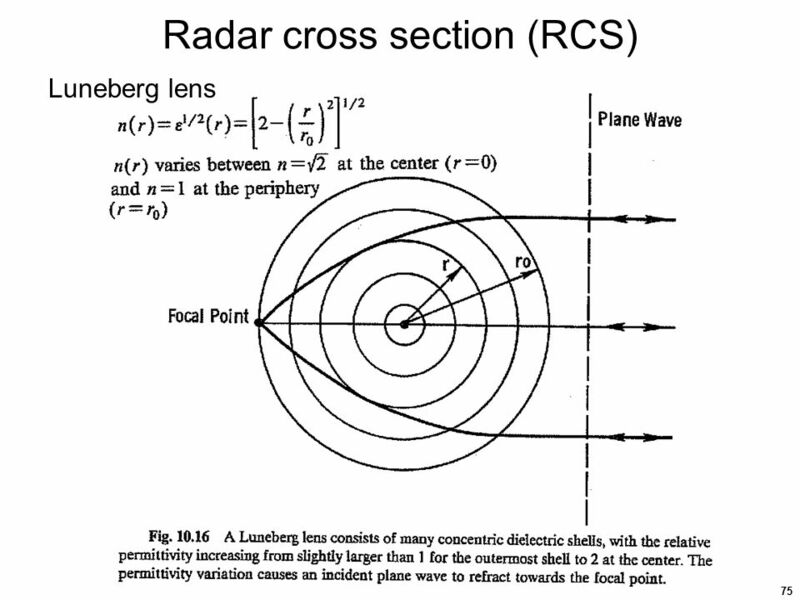 Frequency resolution is inversely related to the observation time. 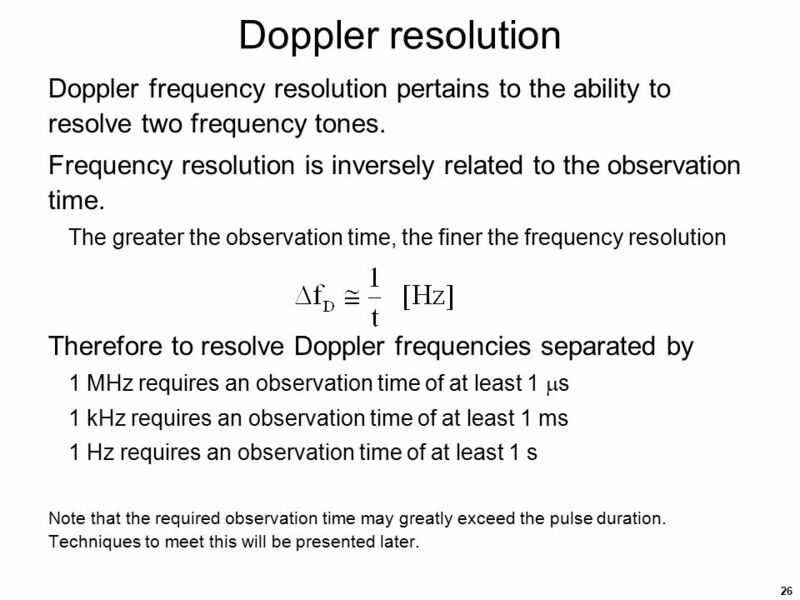 The greater the observation time, the finer the frequency resolution Therefore to resolve Doppler frequencies separated by 1 MHz requires an observation time of at least 1 s 1 kHz requires an observation time of at least 1 ms 1 Hz requires an observation time of at least 1 s Note that the required observation time may greatly exceed the pulse duration. 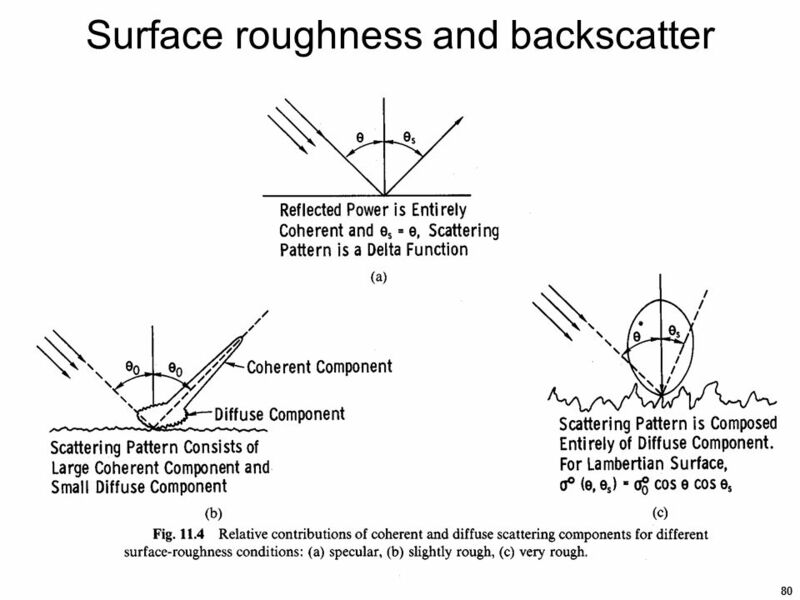 Techniques to meet this will be presented later. 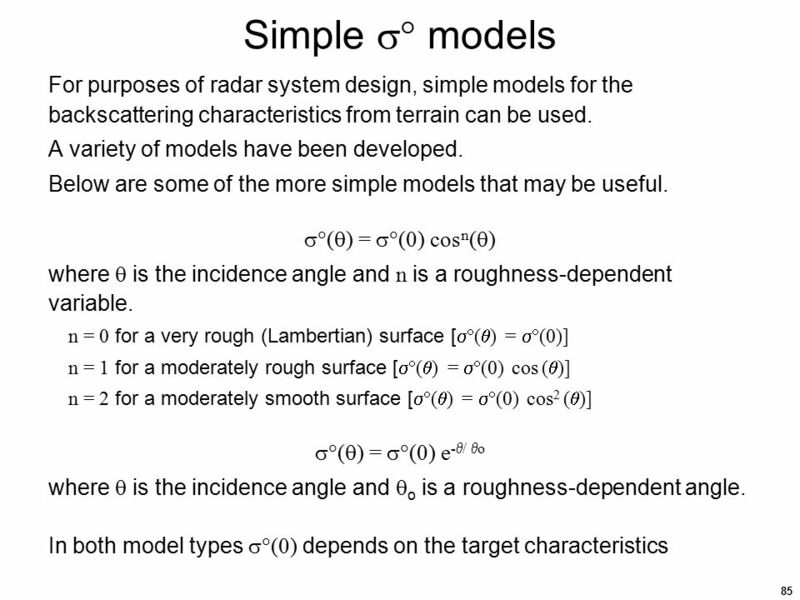 Example Consider an application where T = 10 s and G = 36 dBi (4000). 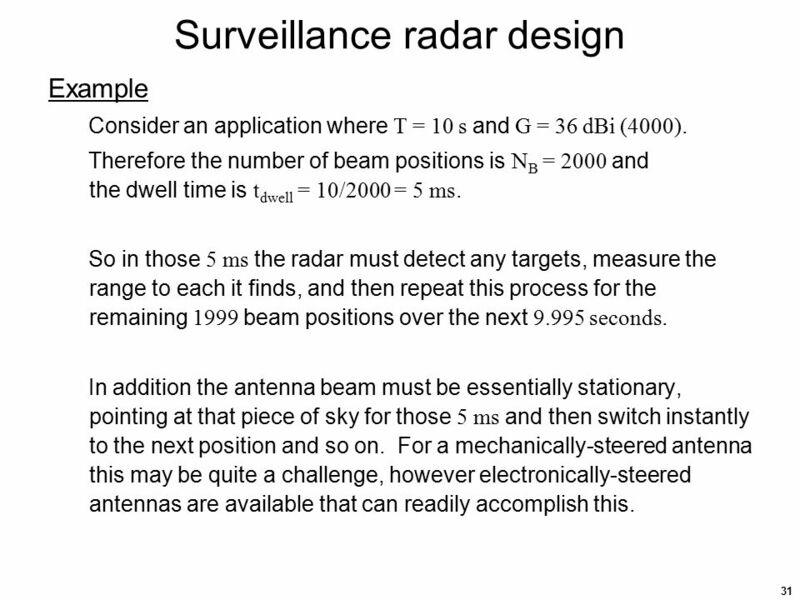 Therefore the number of beam positions is NB = 2000 and the dwell time is tdwell = 10/2000 = 5 ms. 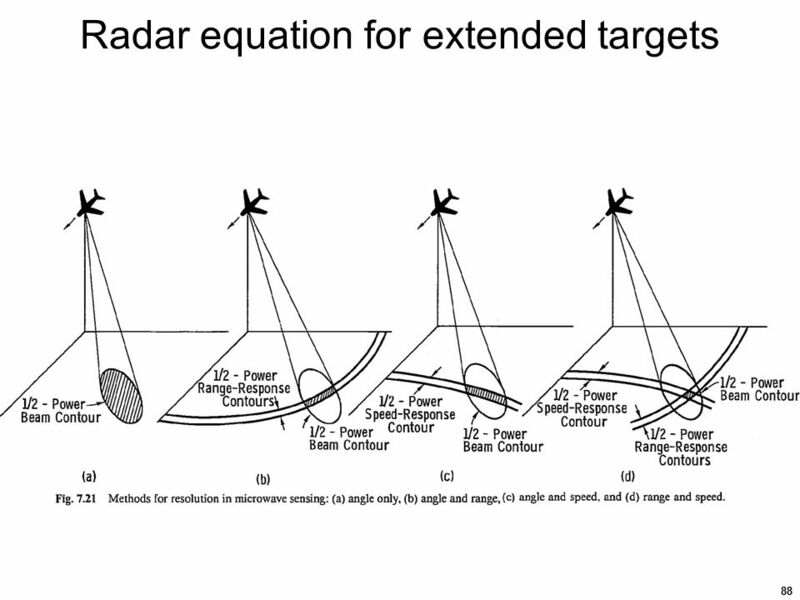 So in those 5 ms the radar must detect any targets, measure the range to each it finds, and then repeat this process for the remaining 1999 beam positions over the next seconds. 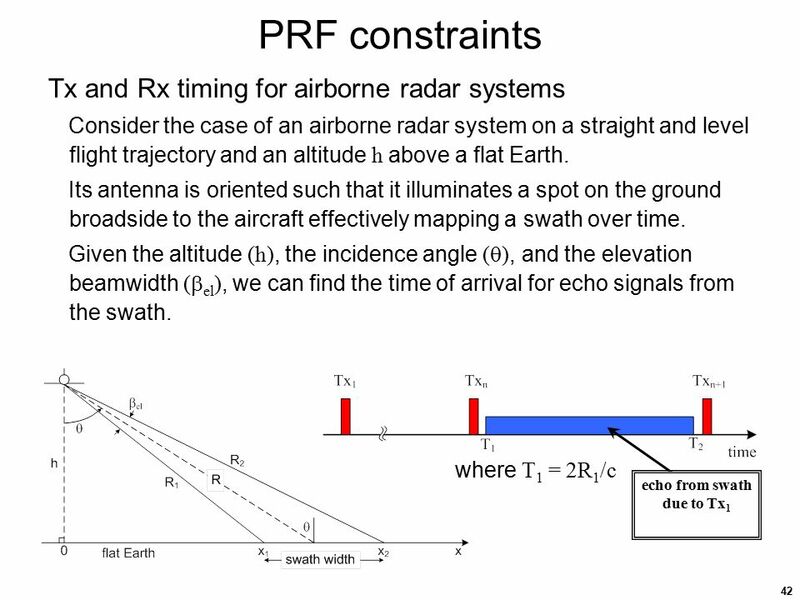 In addition the antenna beam must be essentially stationary, pointing at that piece of sky for those 5 ms and then switch instantly to the next position and so on. 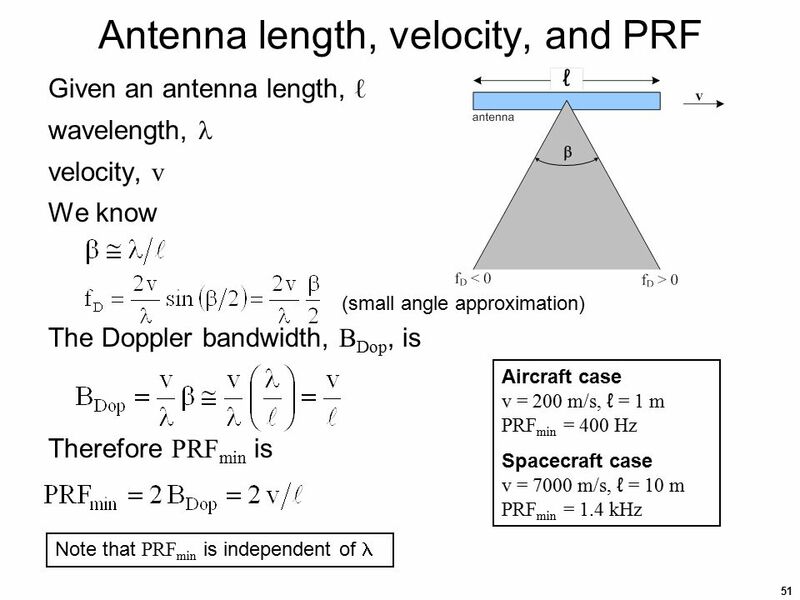 For a mechanically-steered antenna this may be quite a challenge, however electronically-steered antennas are available that can readily accomplish this. 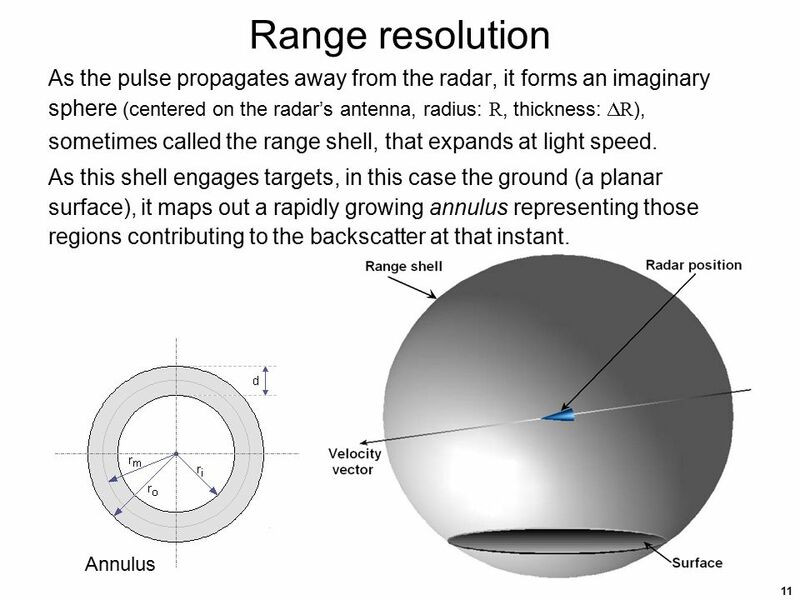 Consider the case where a target at range 130 km is surveyed with a radar configured with a 100-km unambiguous range. 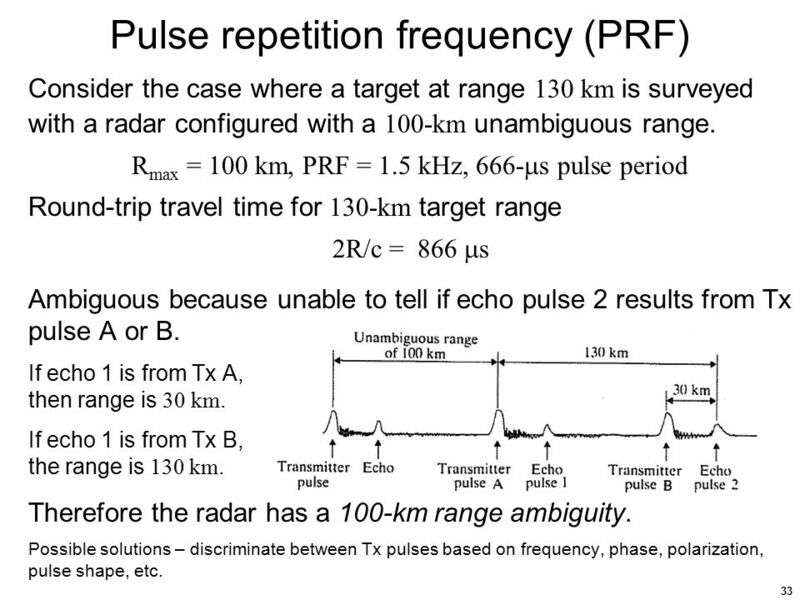 Rmax = 100 km, PRF = 1.5 kHz, 666-s pulse period Round-trip travel time for 130-km target range 2R/c = 866 s Ambiguous because unable to tell if echo pulse 2 results from Tx pulse A or B. 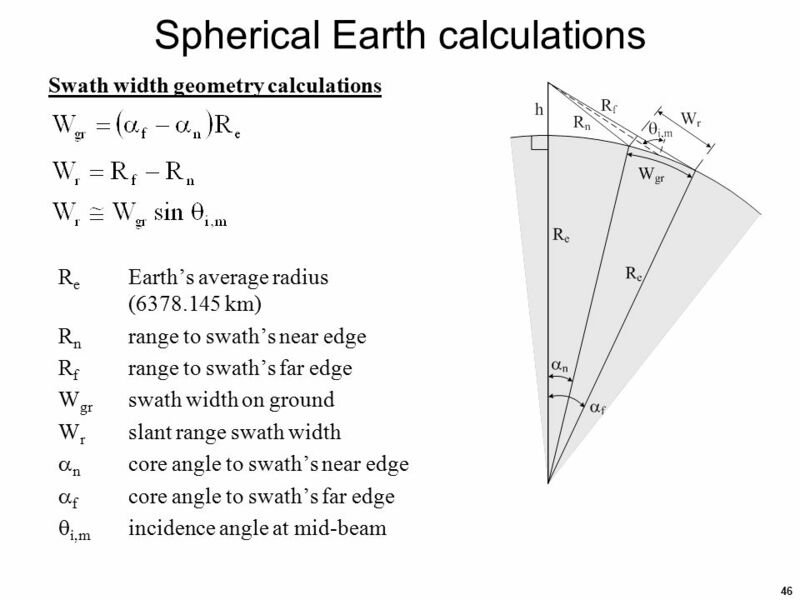 If echo 1 is from Tx A, then range is 30 km. 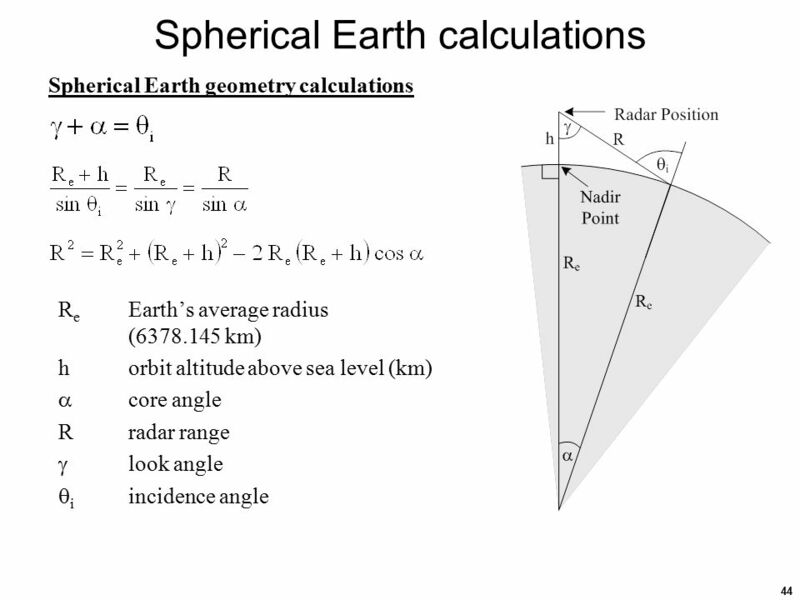 If echo 1 is from Tx B, the range is 130 km. 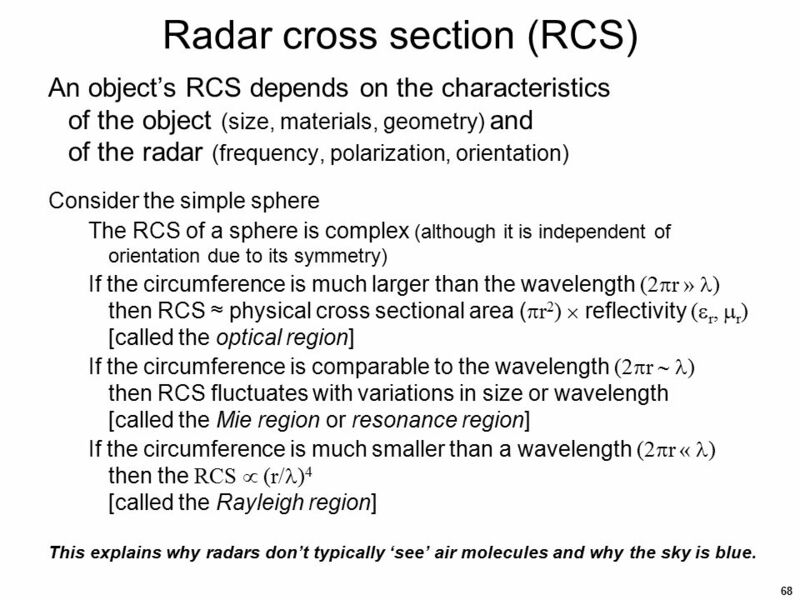 Therefore the radar has a 100-km range ambiguity. 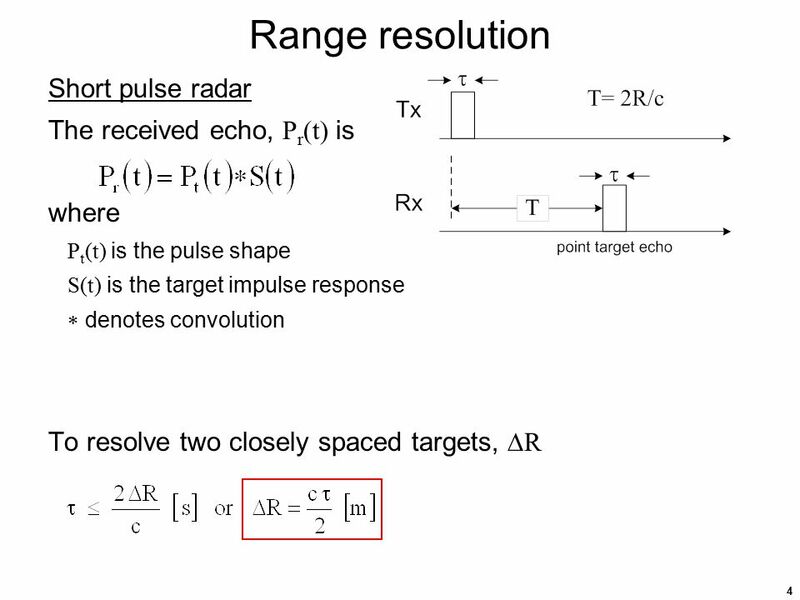 Possible solutions – discriminate between Tx pulses based on frequency, phase, polarization, pulse shape, etc. 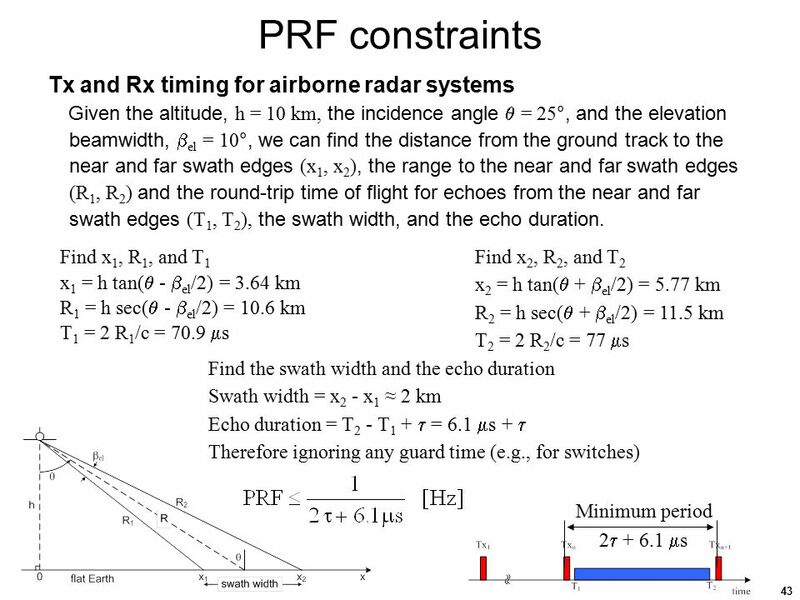 Another approach to resolving range ambiguities is to vary the PRF. 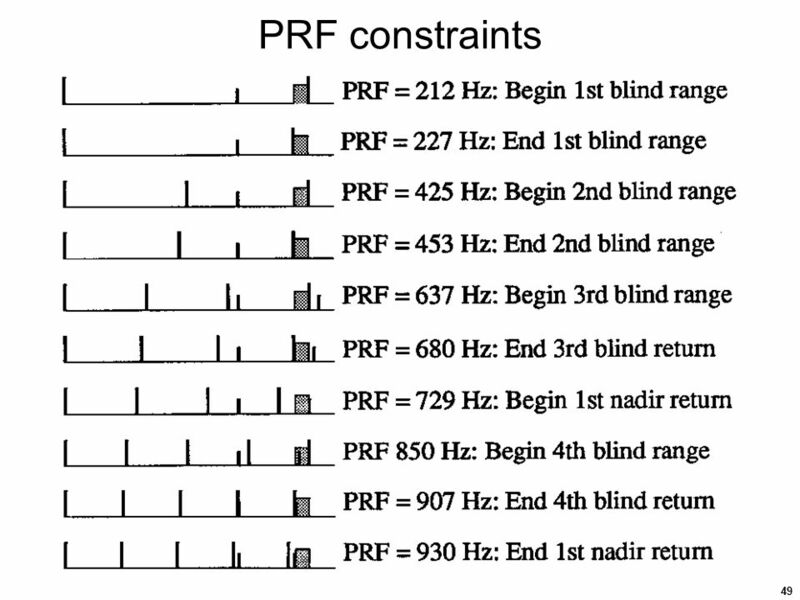 (called PRF jitter or staggered PRF) Example Target range, R = 4050 m (2R/c = 27 s) PRF1 = 50 kHz (PRI1 = 20 s) PRF2 = 54 kHz (PRI2 = 18.5 s) PRI (pulse repetition interval) = 1/PRF [s] Also known as pulse repetition period (PRP), pulse repetition time (PRT), or inter-pulse period (IPP). 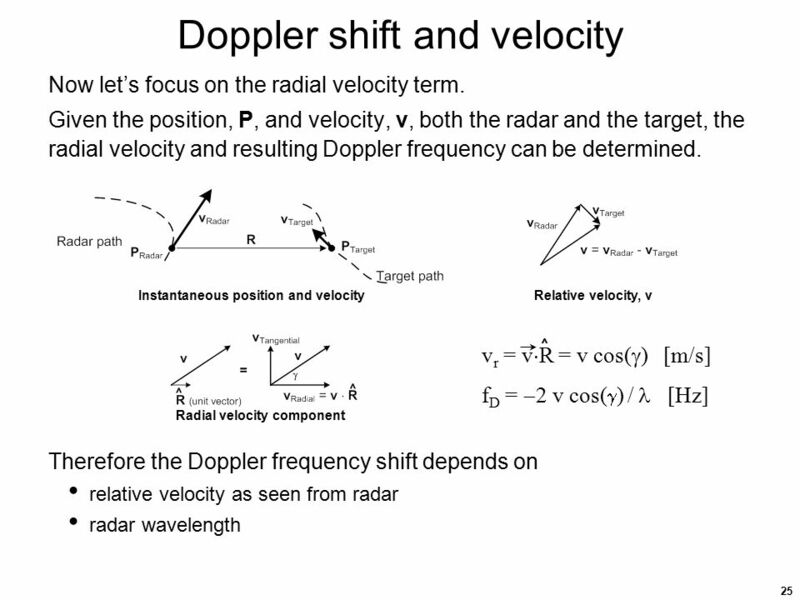 Doppler ambiguities The relative radial velocity produces a Doppler frequency shift. 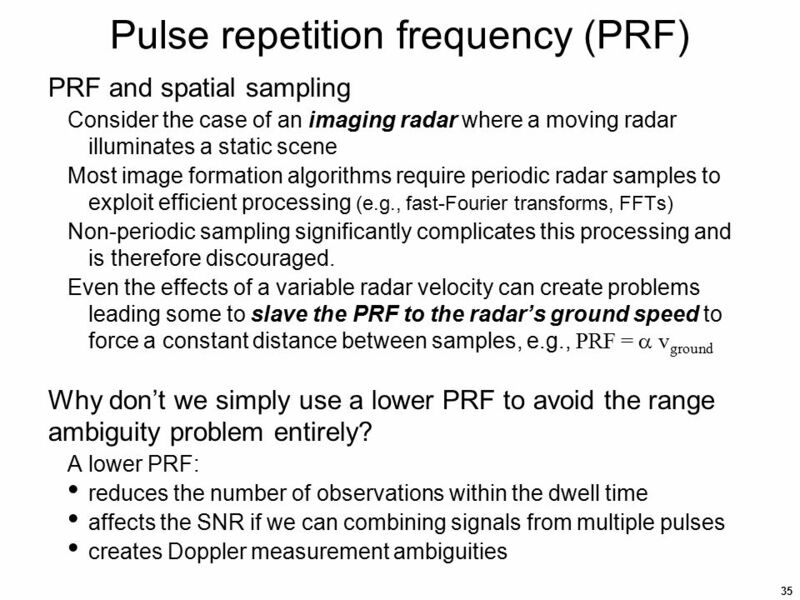 For modest pulse durations (ns to s) the observation time is too short to resolve and accurately measure fD. 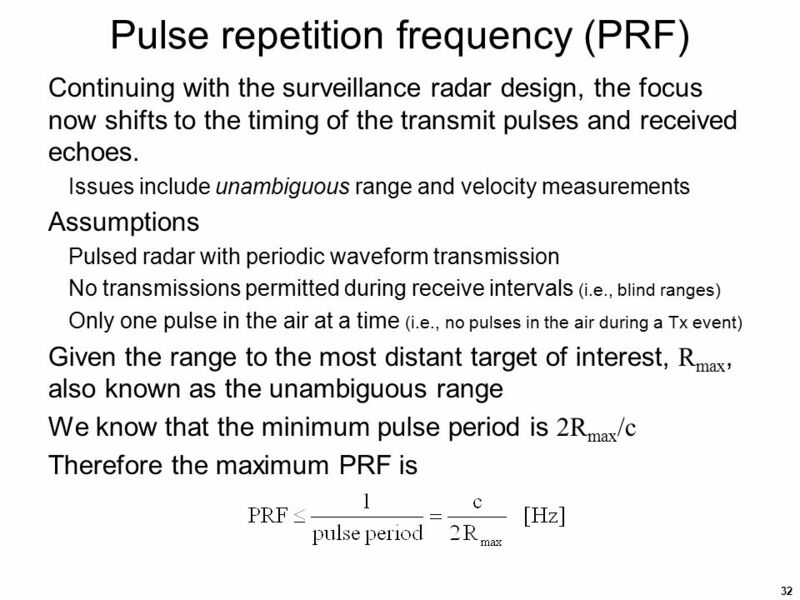 For a 1-s pulse duration, , (and a 1-s echo duration from a point target) the frequency resolution, f = 1/ = 1 MHz Doppler frequencies of interest may be 10 to 1000 Hz, typically not MHz Cannot arbitrarily increase pulse duration since the transmitter blinds the receiver creating a blind range, Rblind = c/2 [m] (Rblind = 150 m for  = 1 s) To overcome this limitation, signal phase information from successive pulses can be used for fD discrimination. 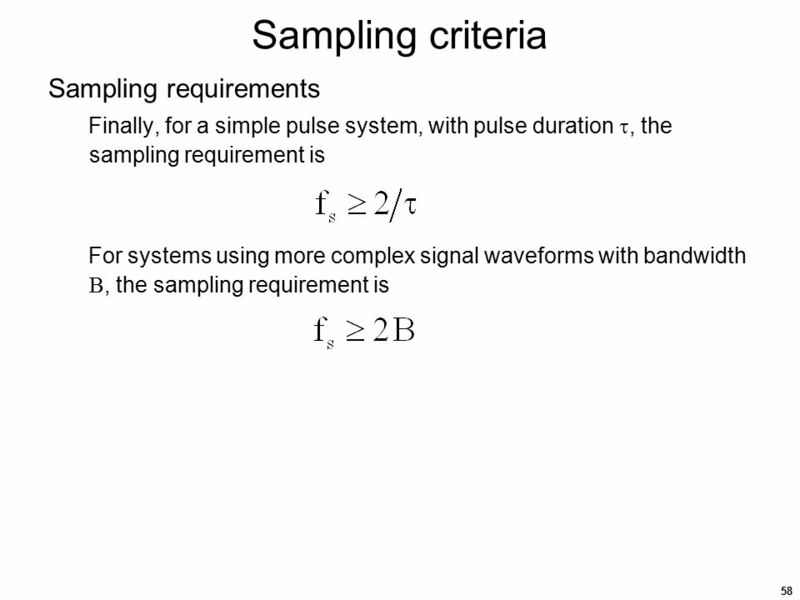 However to adequately sample fD, we must satisfy the Nyquist-Shannon criterion which says that the sampling frequency, fs, must exceed twice the signal’s bandwidth. 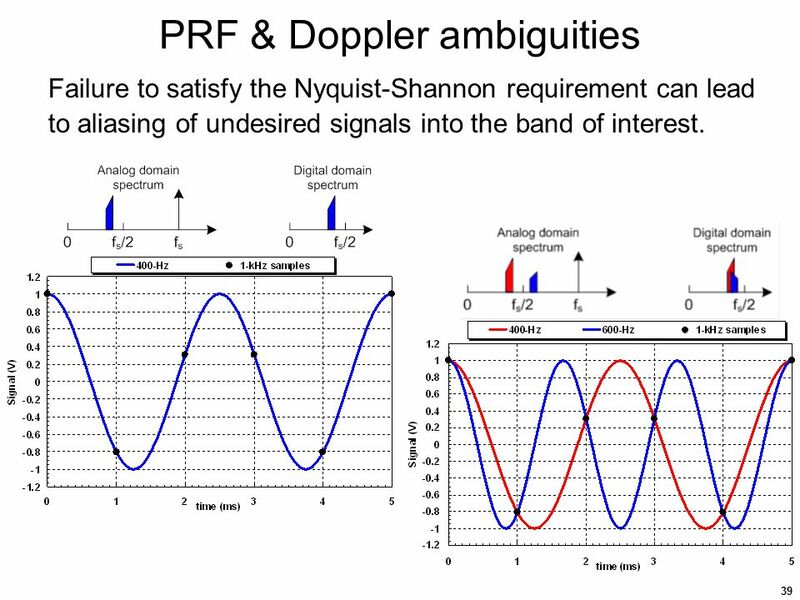 Failure to satisfy the Nyquist-Shannon requirement can lead to aliasing of undesired signals into the band of interest. 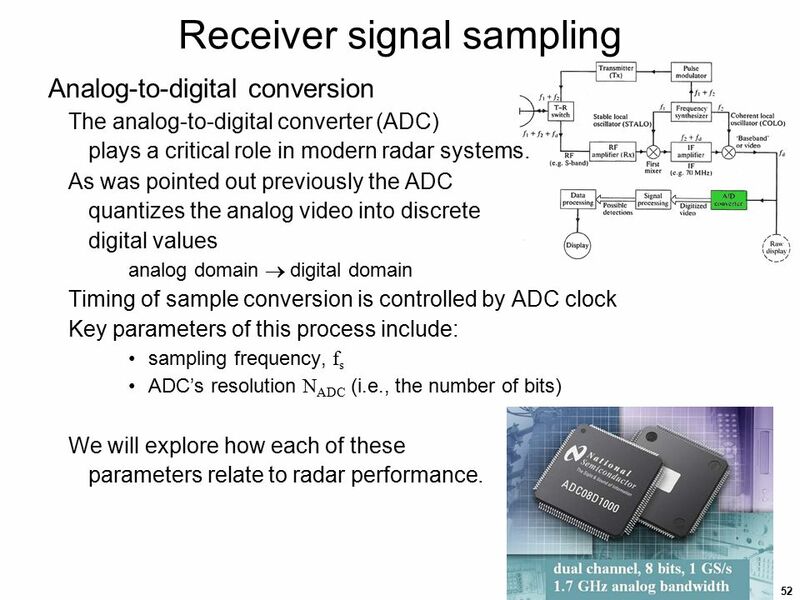 Analog-to-digital conversion The analog-to-digital converter (ADC) plays a critical role in modern radar systems. 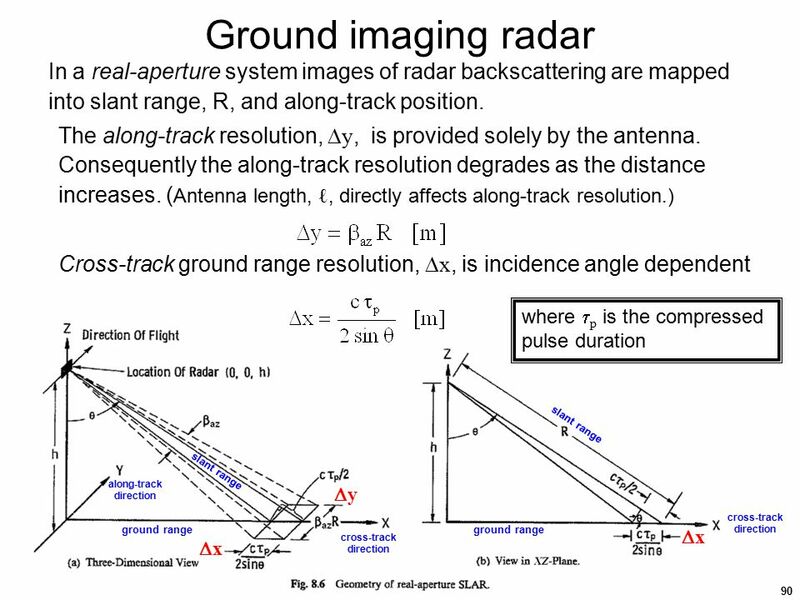 As was pointed out previously the ADC quantizes the analog video into discrete digital values analog domain  digital domain Timing of sample conversion is controlled by ADC clock Key parameters of this process include: sampling frequency, fs ADC’s resolution NADC (i.e., the number of bits) We will explore how each of these parameters relate to radar performance. 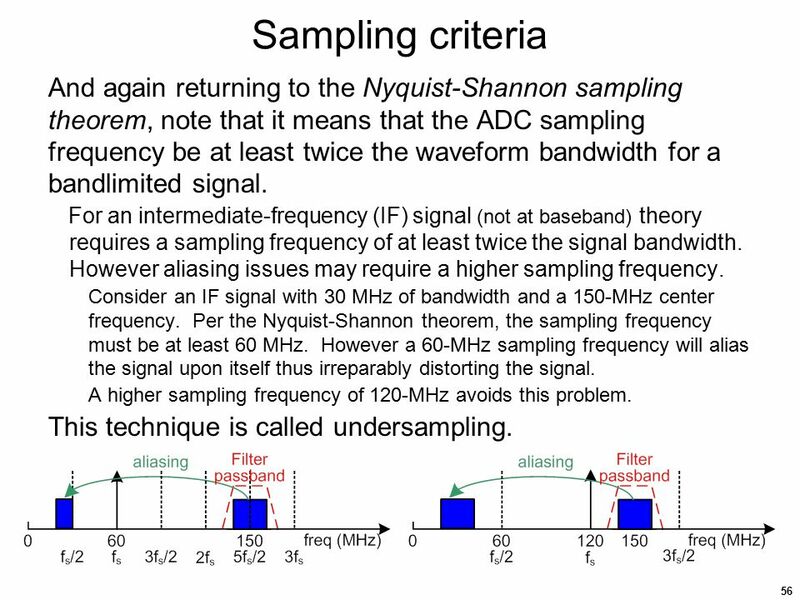 55 Sampling criteria Returning our attention to the Nyquist-Shannon sampling theorem, note that it means that the ADC sampling frequency be at least twice the waveform bandwidth for a bandlimited signal. 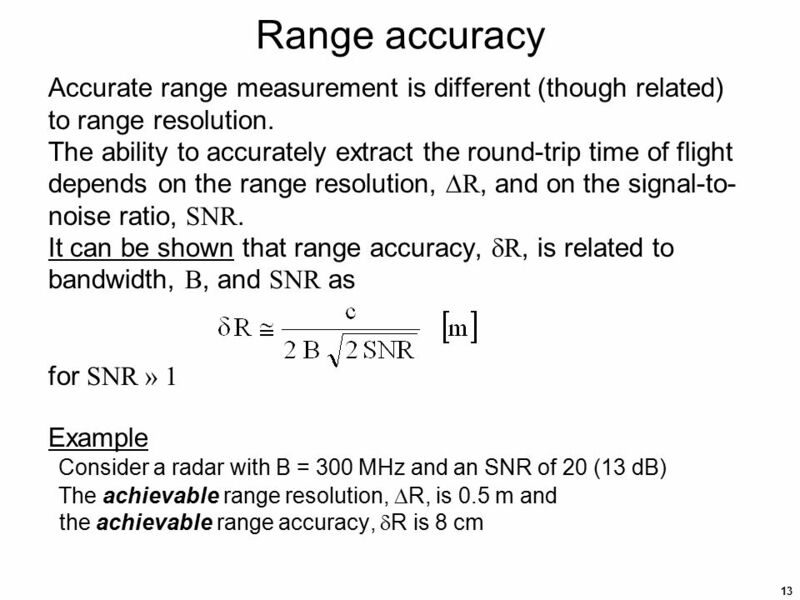 Thus for a baseband signal this requires the maximum signal frequency be less than or equal to 50% of the sampling frequency; hardware realization typically is more conservative due to challenges associated achieving a bandlimited signal. 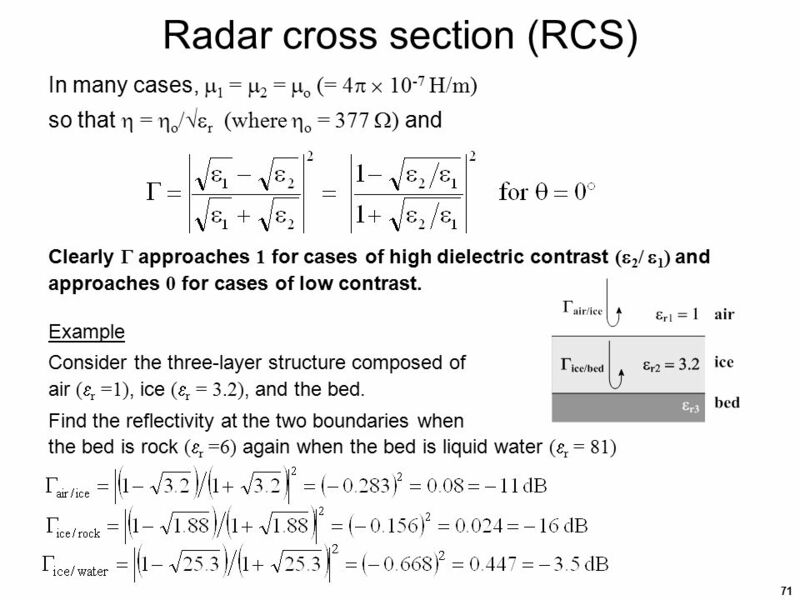 Consider a baseband signal with spectral components from DC to 100 MHz. 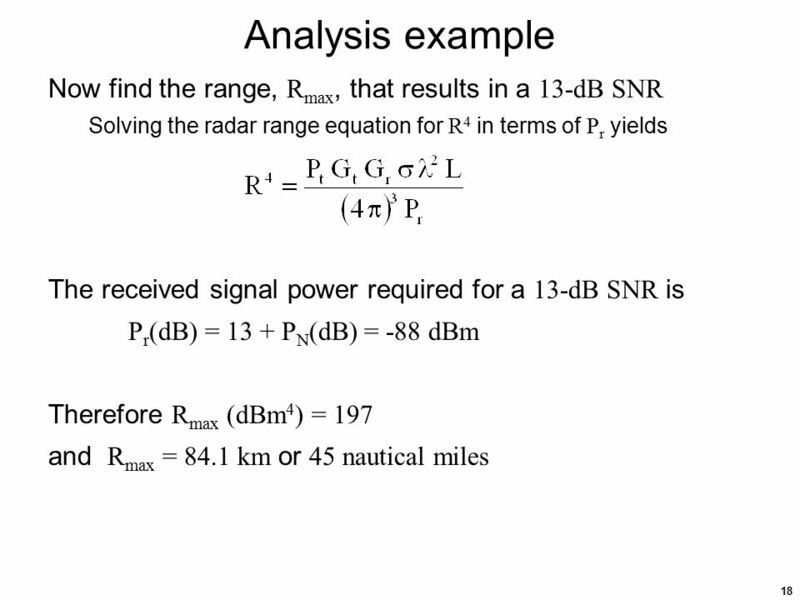 According to the Nyquist-Shannon theorem, a 200-MHz sampling frequency will suffice. 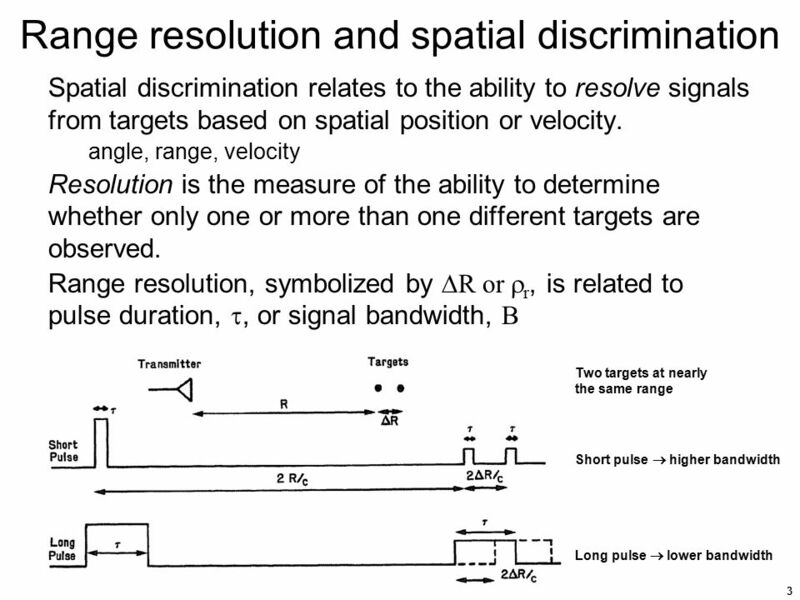 To avoid severe requirements on the analog anti-aliasing filter that precedes the ADC (used to ensure a bandlimited signal) an additional margin will be added by requiring the maximum signal frequency to be 40% of fs, thus a 250-MHz sampling frequency might be used. 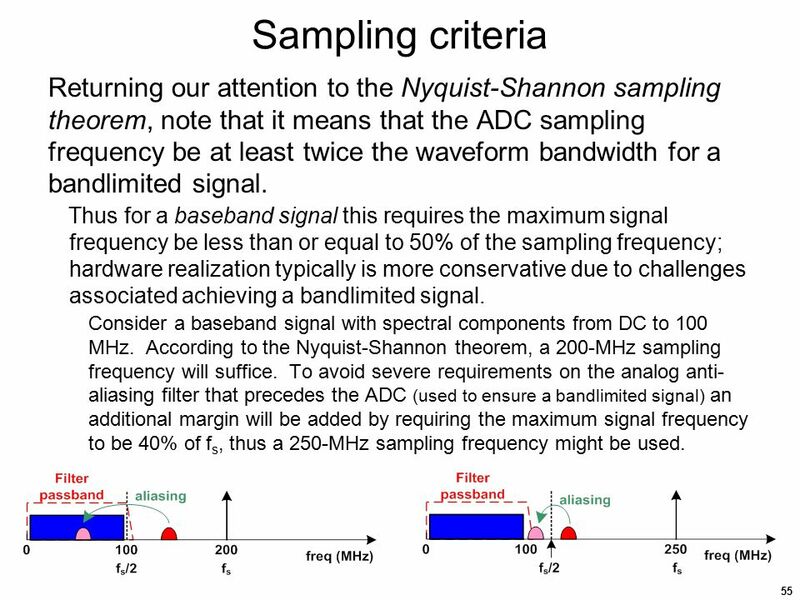 56 Sampling criteria And again returning to the Nyquist-Shannon sampling theorem, note that it means that the ADC sampling frequency be at least twice the waveform bandwidth for a bandlimited signal. 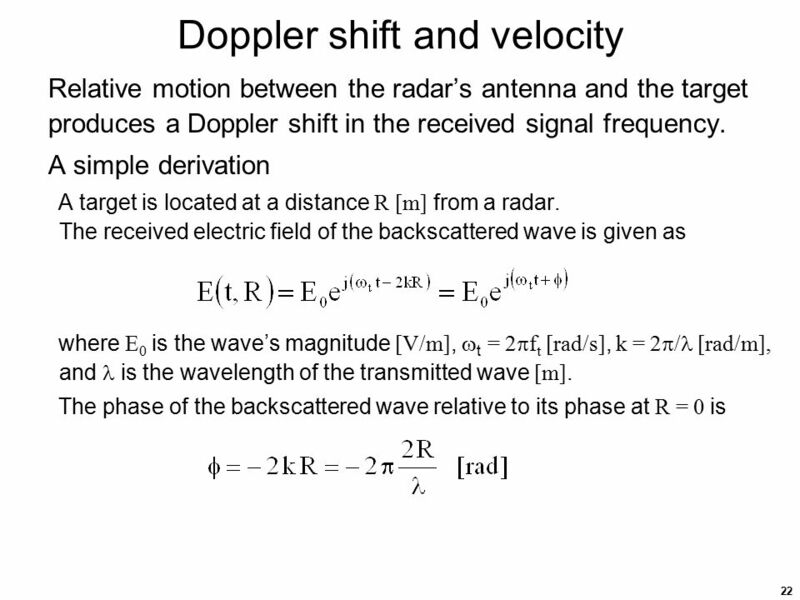 For an intermediate-frequency (IF) signal (not at baseband) theory requires a sampling frequency of at least twice the signal bandwidth. 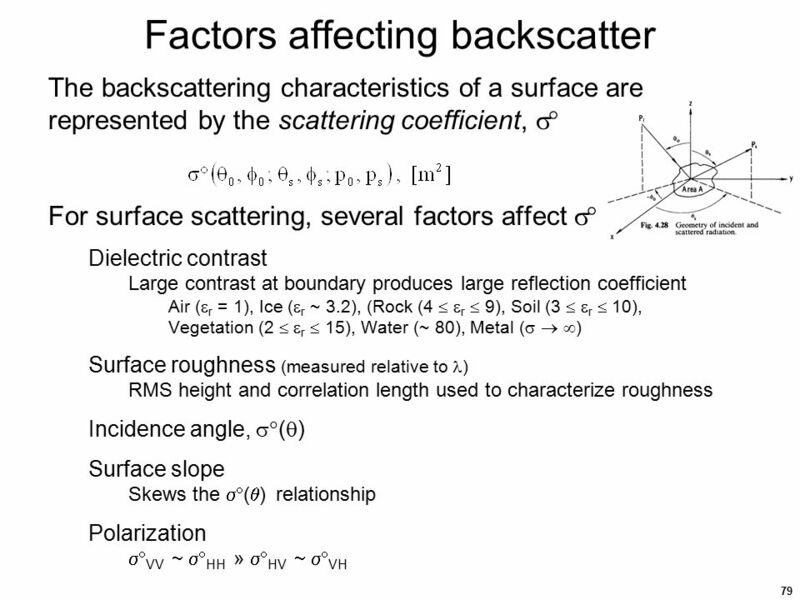 However aliasing issues may require a higher sampling frequency. 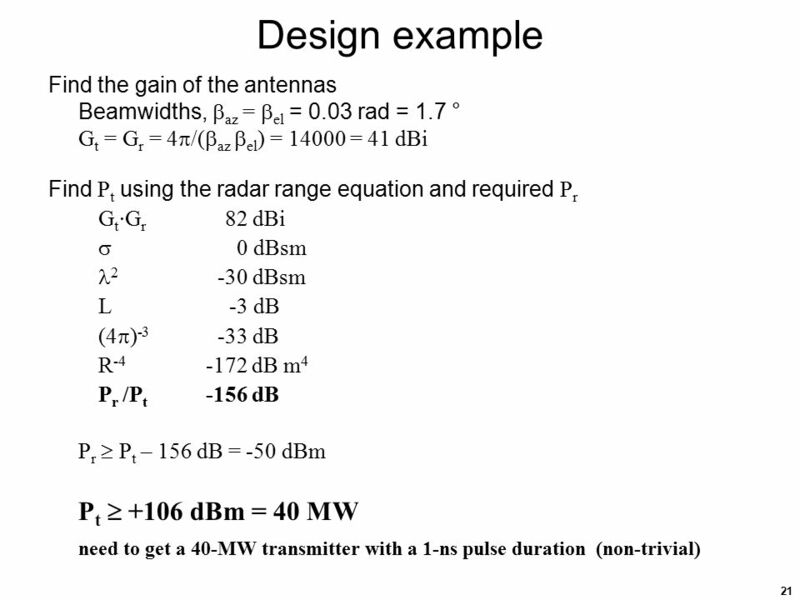 Consider an IF signal with 30 MHz of bandwidth and a 150-MHz center frequency. 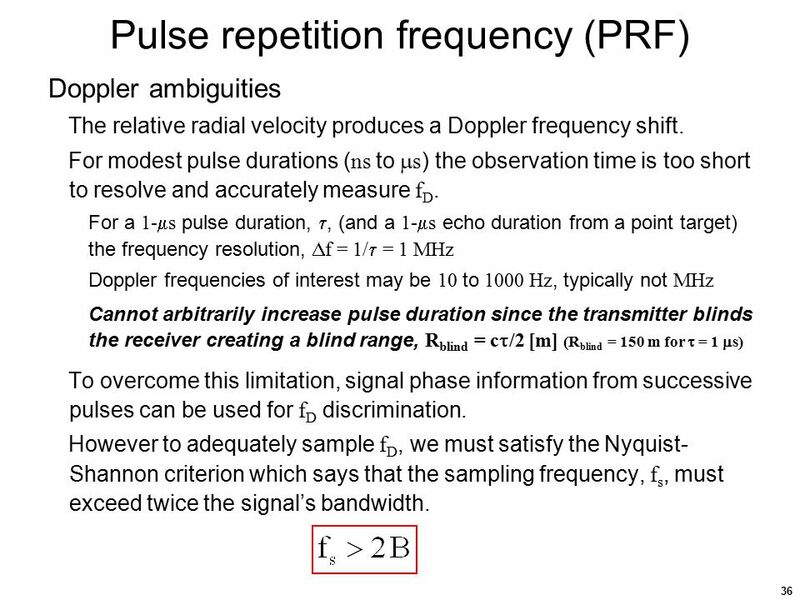 Per the Nyquist-Shannon theorem, the sampling frequency must be at least 60 MHz. 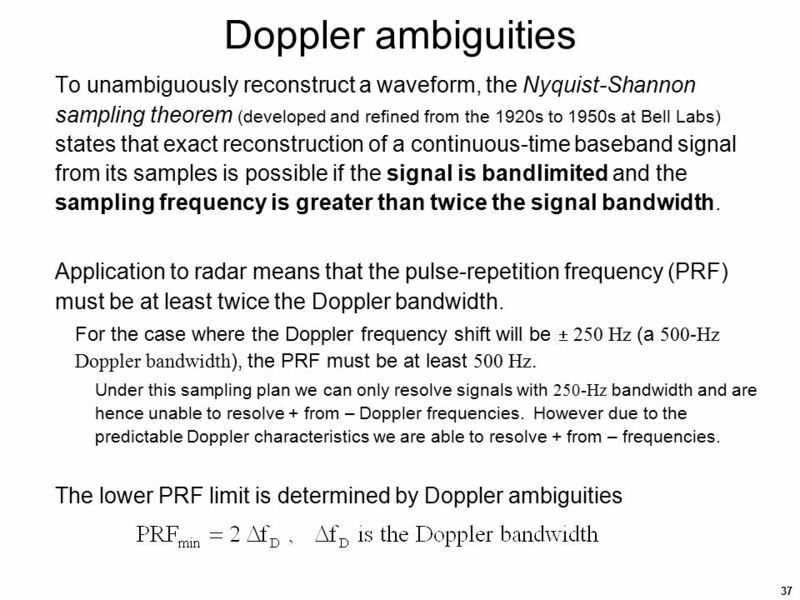 However a 60-MHz sampling frequency will alias the signal upon itself thus irreparably distorting the signal. 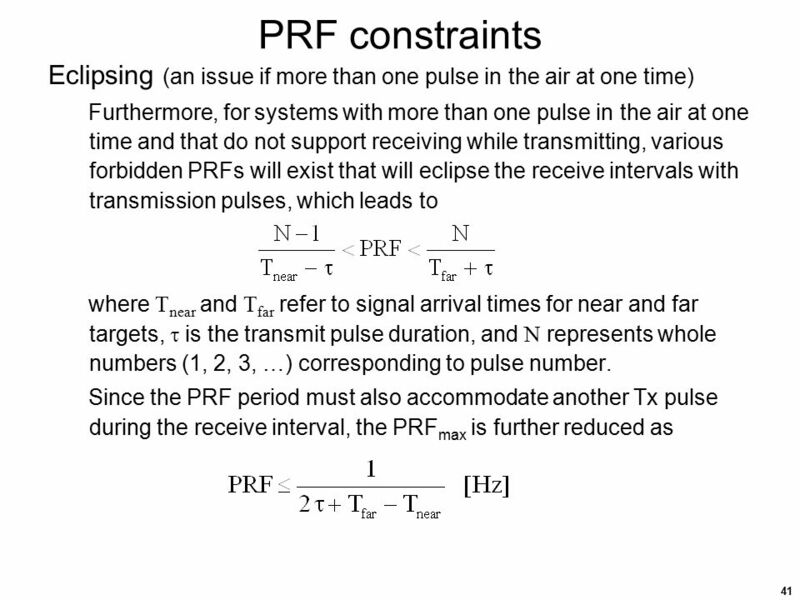 A higher sampling frequency of 120-MHz avoids this problem. 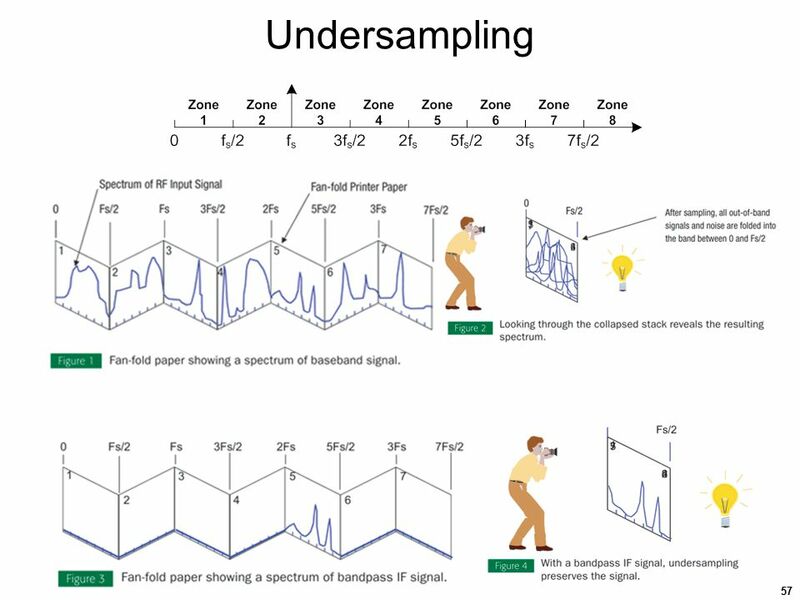 This technique is called undersampling. 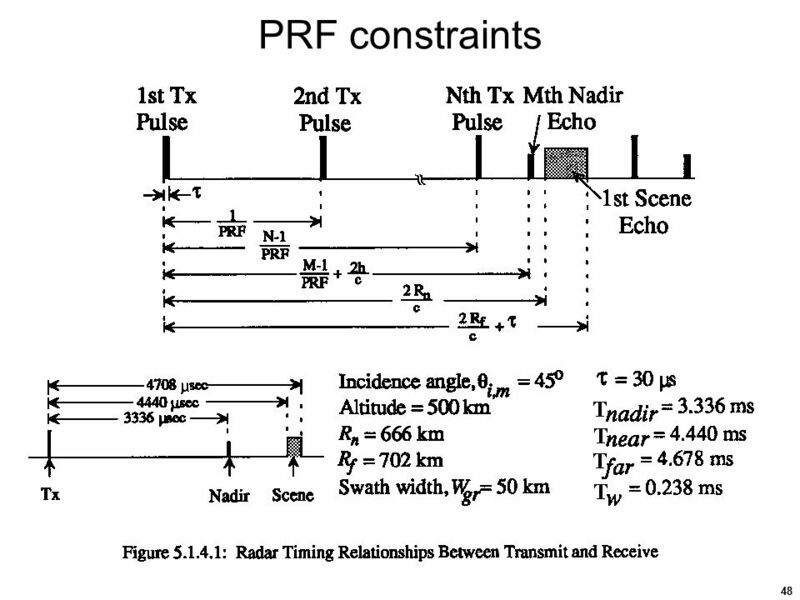 Radar systems sample the backscattered echo signal over two time scales. 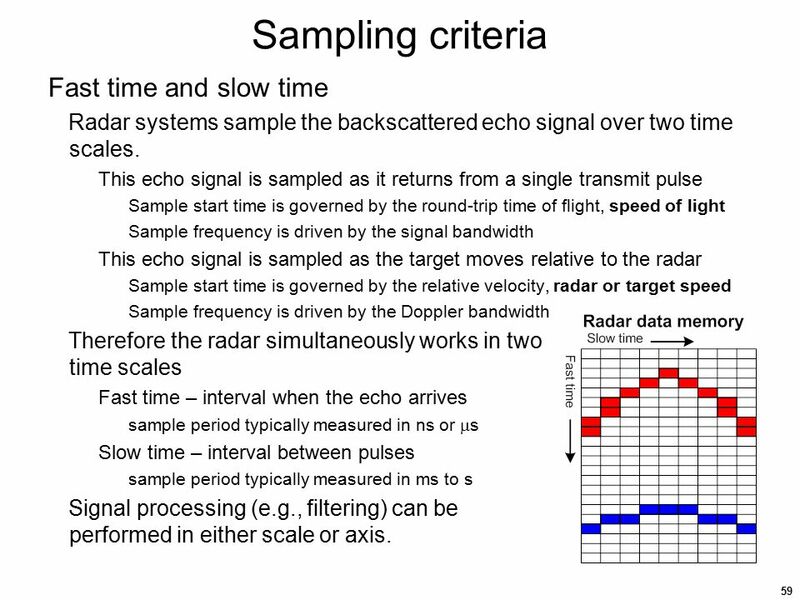 This echo signal is sampled as it returns from a single transmit pulse Sample start time is governed by the round-trip time of flight, speed of light Sample frequency is driven by the signal bandwidth This echo signal is sampled as the target moves relative to the radar Sample start time is governed by the relative velocity, radar or target speed Sample frequency is driven by the Doppler bandwidth Therefore the radar simultaneously works in two time scales Fast time – interval when the echo arrives sample period typically measured in ns or s Slow time – interval between pulses sample period typically measured in ms to s Signal processing (e.g., filtering) can be performed in either scale or axis. 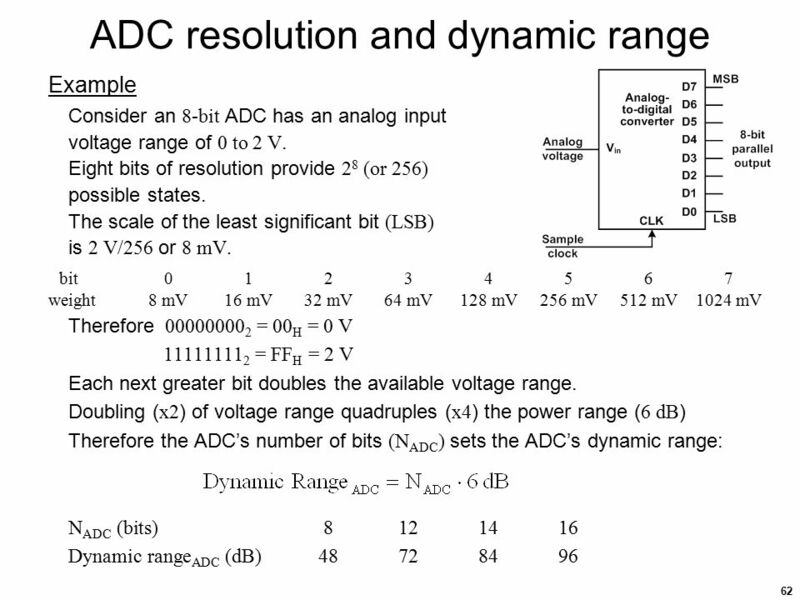 The ADC quantizes the analog input signal into a fixed number of bits, NADC, that is sometimes called the ADC’s resolution. 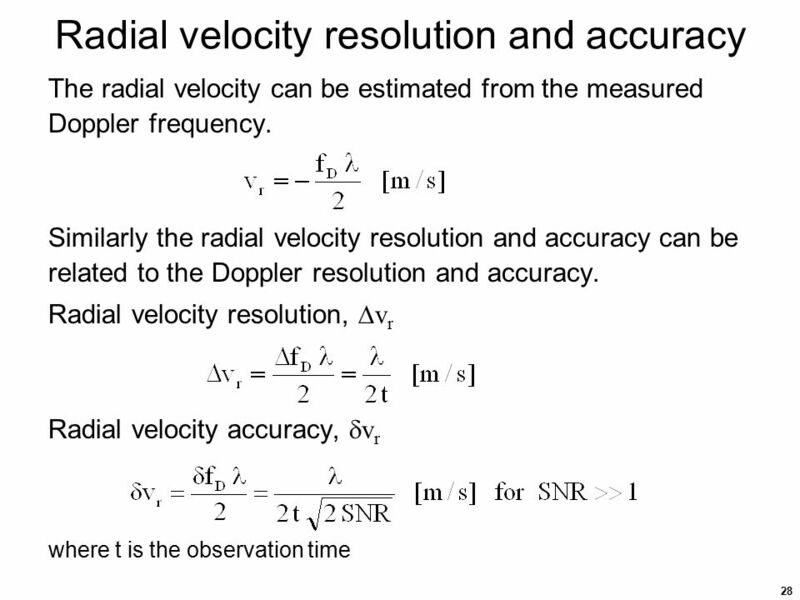 This parameter is important in radar applications as it is related to the ADC’s dynamic range and thus affects the radar’s instantaneous dynamic range. 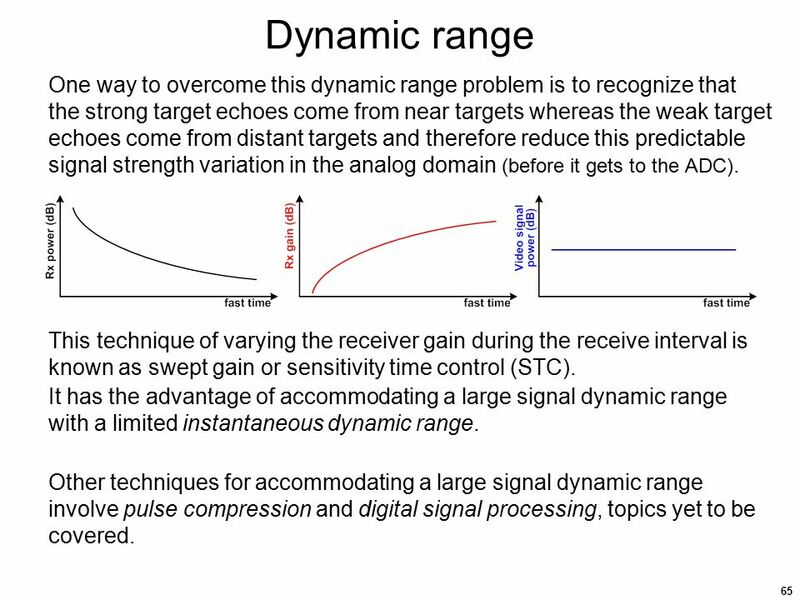 Dynamic range – the range of signal powers over which the signal is detectable and linear The dynamic range’s lower limit is the minimum detectable signal which is related to the SNR. 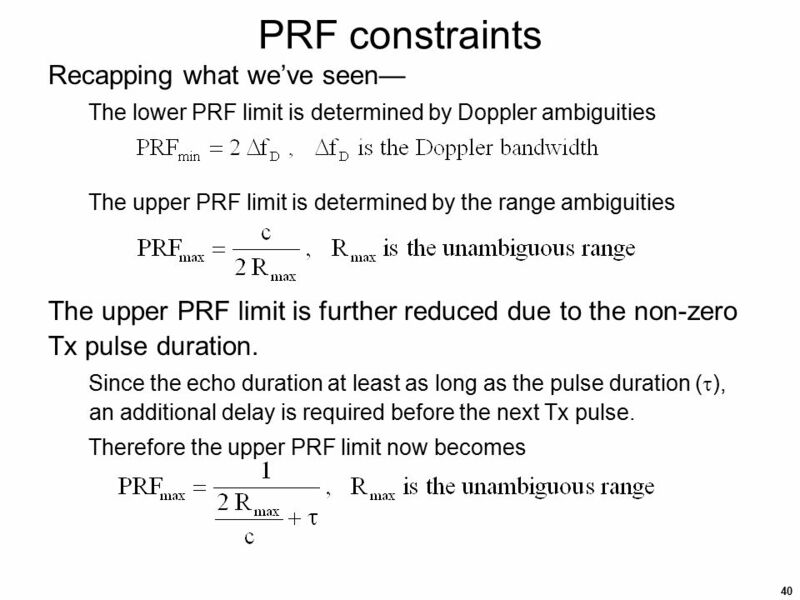 The dynamic range’s upper limit is that power level that causes the receiver’s transfer function to become nonlinear (typically involving saturation). 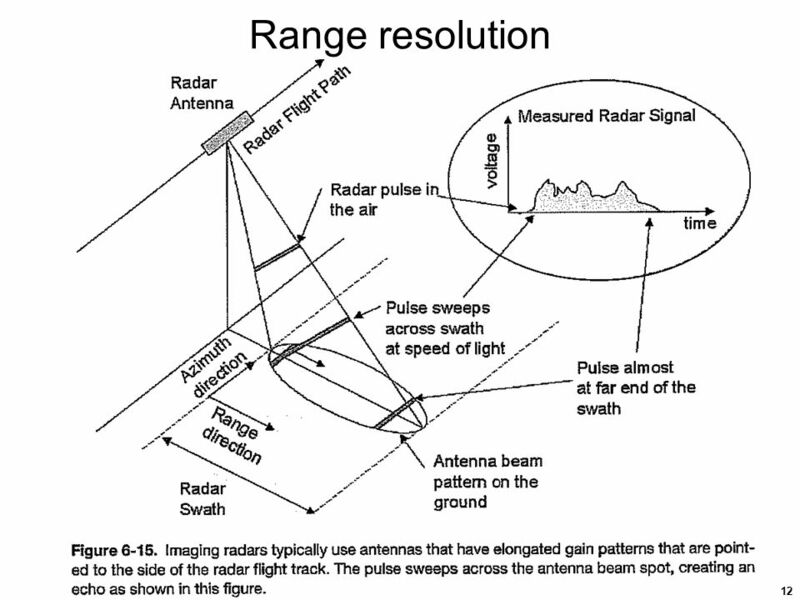 The radar’s dynamic range is determined by the dynamic range of several components in the receiver, both analog and digital. 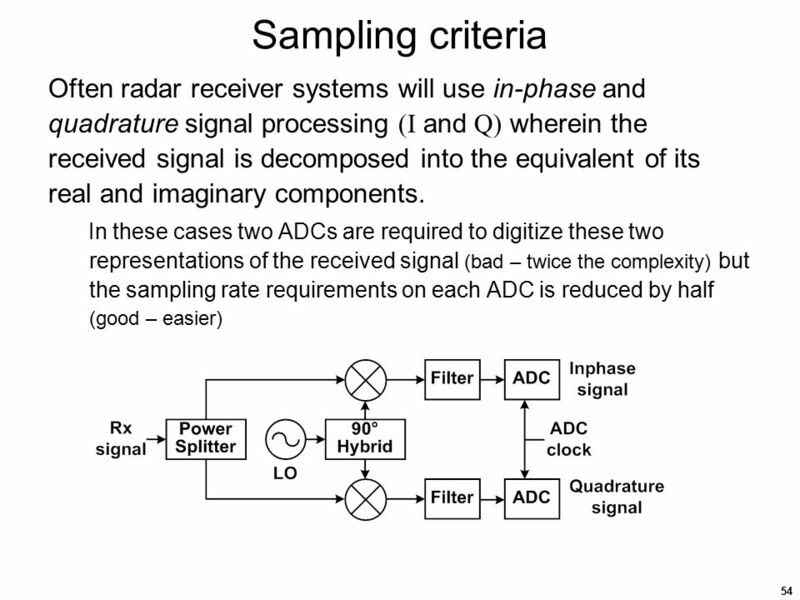 The analog components (e.g., amplifiers, mixers, filters, switches, etc.) 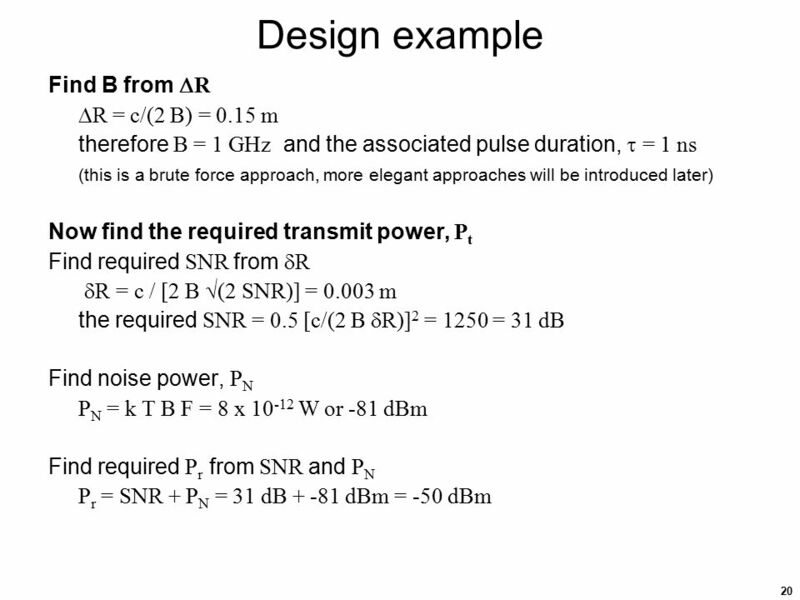 when properly designed will have a tremendous dynamic range (> 100 dB). 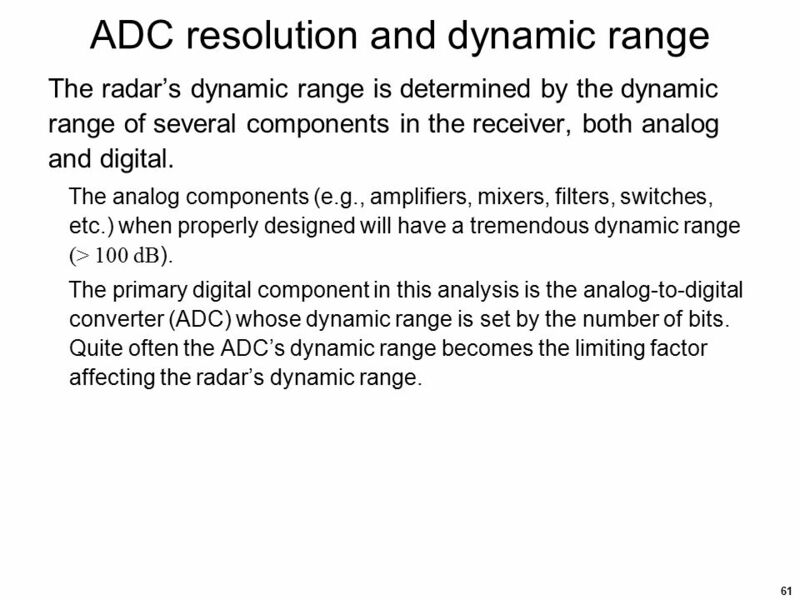 The primary digital component in this analysis is the analog-to-digital converter (ADC) whose dynamic range is set by the number of bits. 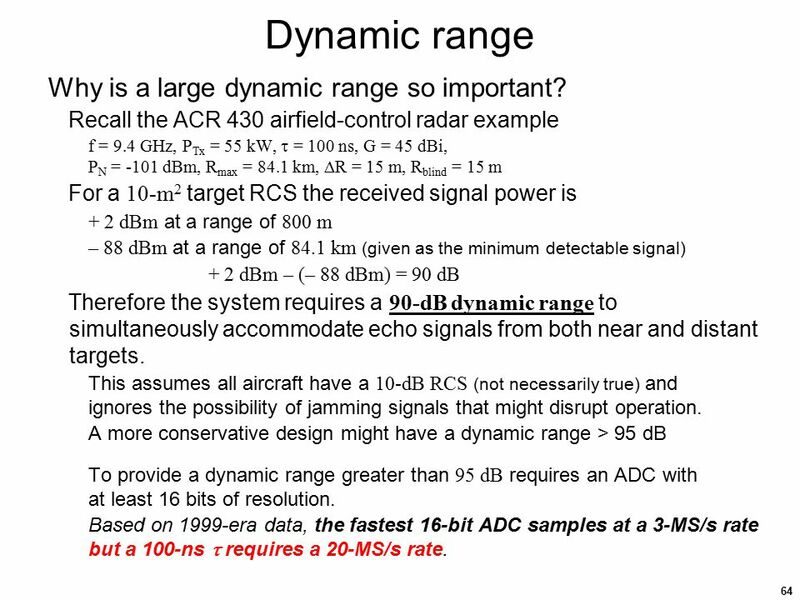 Quite often the ADC’s dynamic range becomes the limiting factor affecting the radar’s dynamic range. 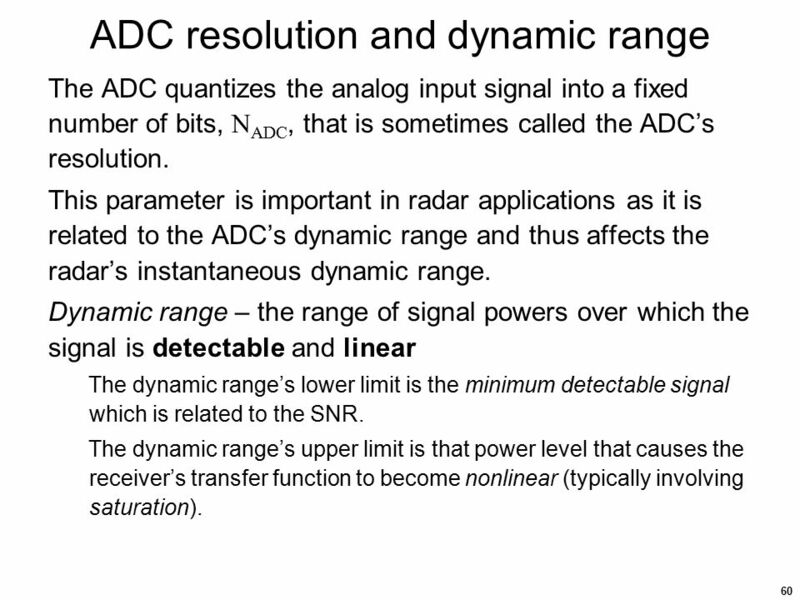 Since the ADC’s dynamic range improves with NADC, a large number of ADC bits is desired. 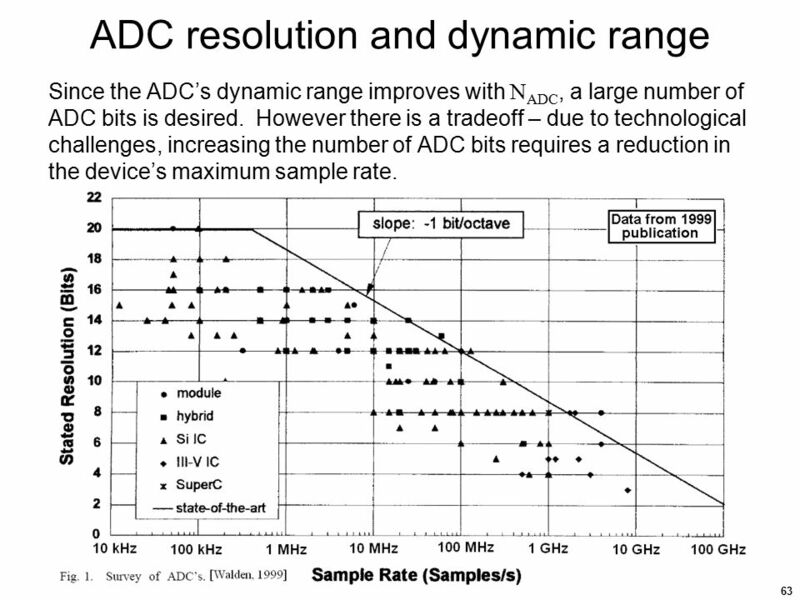 However there is a tradeoff – due to technological challenges, increasing the number of ADC bits requires a reduction in the device’s maximum sample rate. 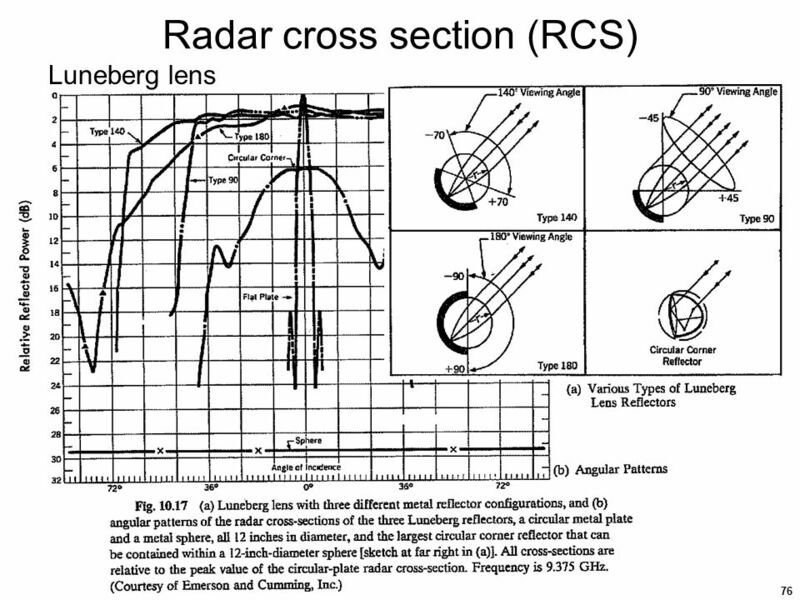 64 Dynamic range Why is a large dynamic range so important? 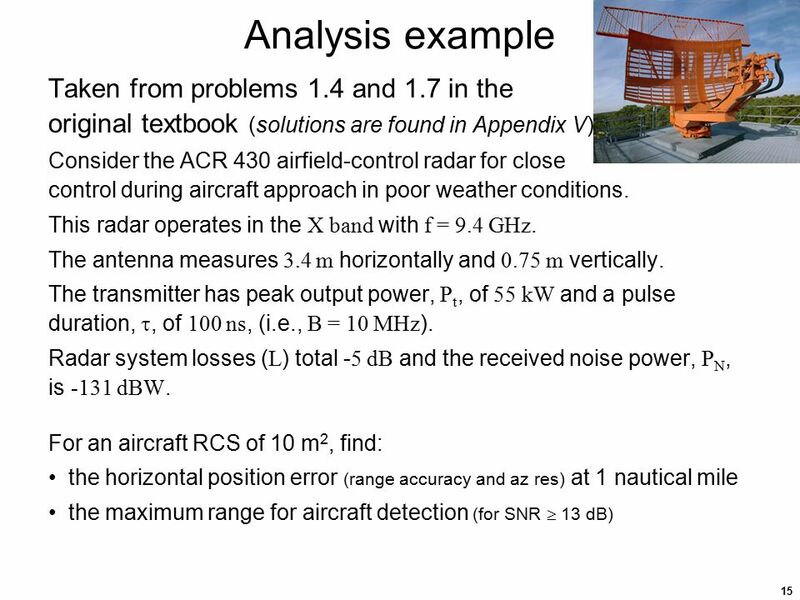 Recall the ACR 430 airfield-control radar example f = 9.4 GHz, PTx = 55 kW,  = 100 ns, G = 45 dBi, PN = -101 dBm, Rmax = 84.1 km, R = 15 m, Rblind = 15 m For a 10-m2 target RCS the received signal power is + 2 dBm at a range of 800 m – 88 dBm at a range of 84.1 km (given as the minimum detectable signal) + 2 dBm – (– 88 dBm) = 90 dB Therefore the system requires a 90-dB dynamic range to simultaneously accommodate echo signals from both near and distant targets. 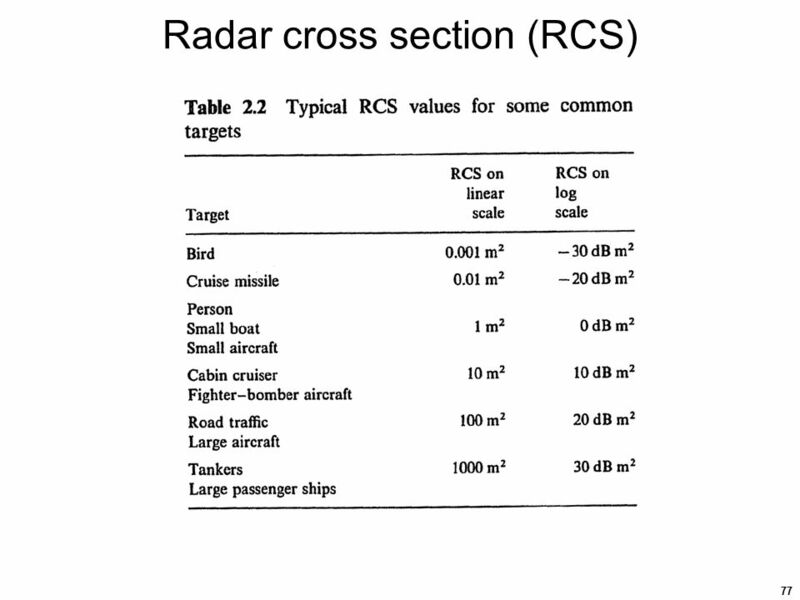 This assumes all aircraft have a 10-dB RCS (not necessarily true) and ignores the possibility of jamming signals that might disrupt operation. 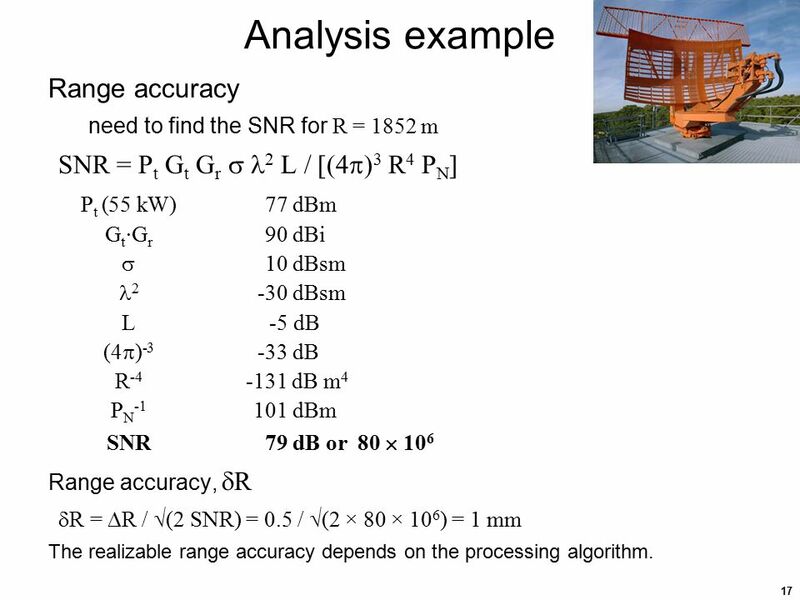 A more conservative design might have a dynamic range > 95 dB To provide a dynamic range greater than 95 dB requires an ADC with at least 16 bits of resolution. 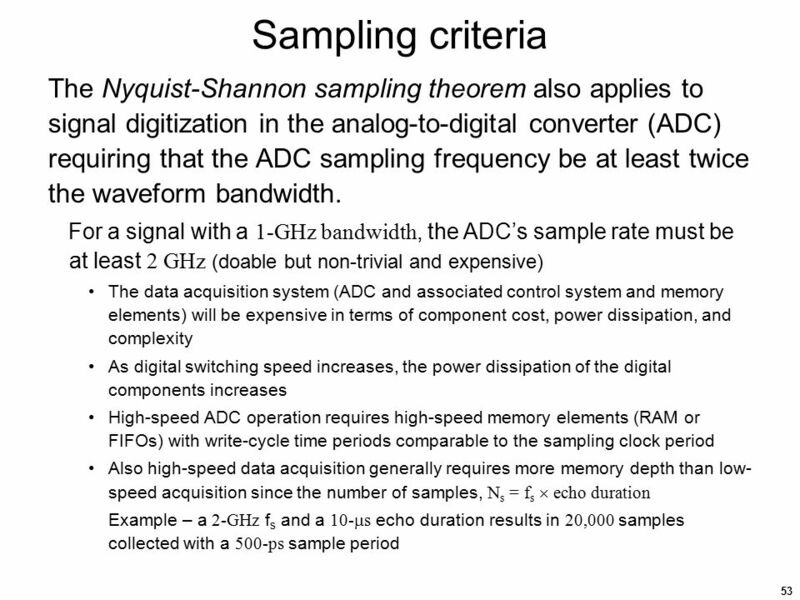 Based on 1999-era data, the fastest 16-bit ADC samples at a 3-MS/s rate but a 100-ns  requires a 20-MS/s rate. 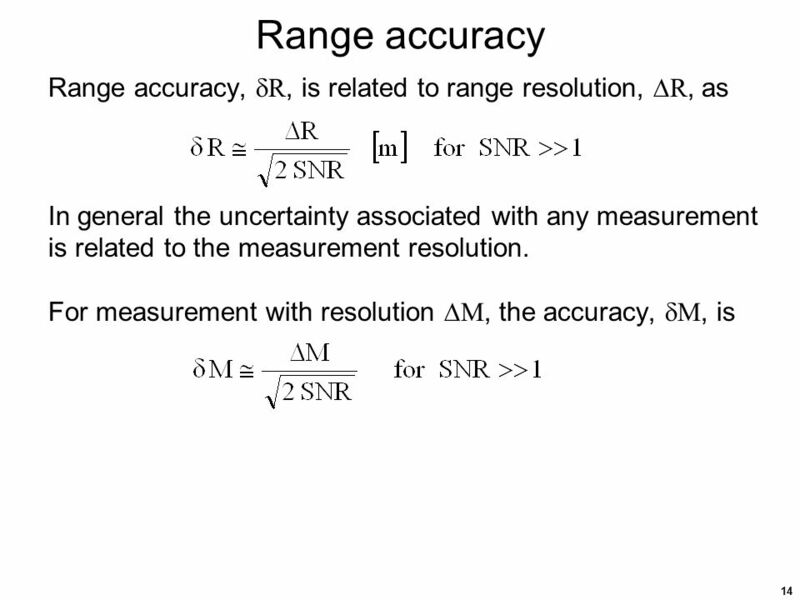 65 Dynamic range One way to overcome this dynamic range problem is to recognize that the strong target echoes come from near targets whereas the weak target echoes come from distant targets and therefore reduce this predictable signal strength variation in the analog domain (before it gets to the ADC). 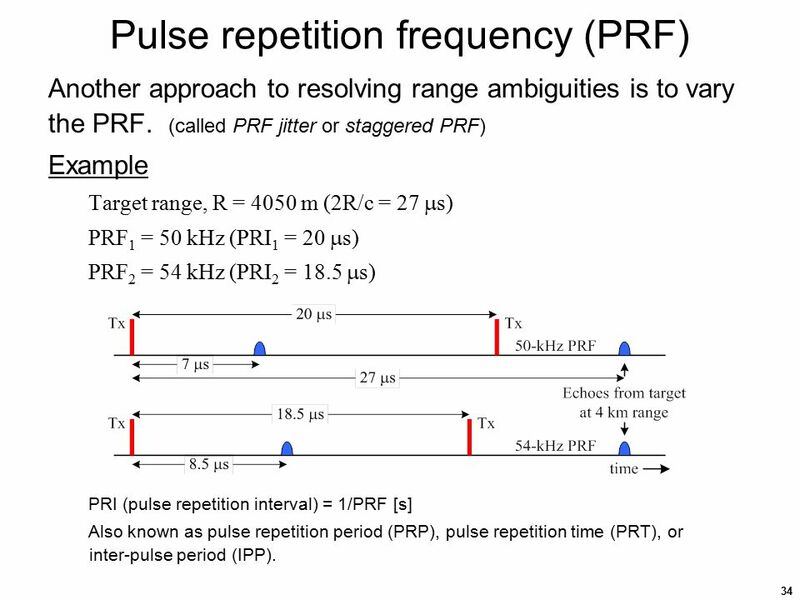 This technique of varying the receiver gain during the receive interval is known as swept gain or sensitivity time control (STC). 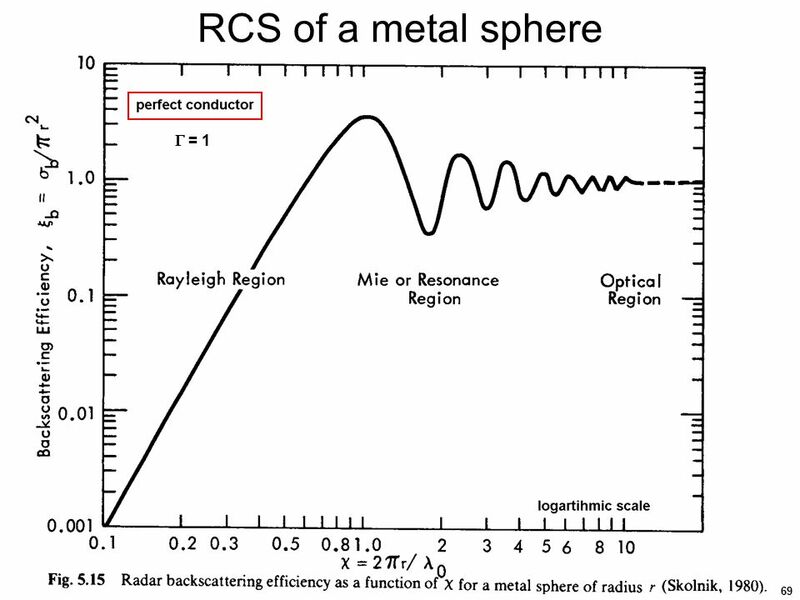 It has the advantage of accommodating a large signal dynamic range with a limited instantaneous dynamic range. 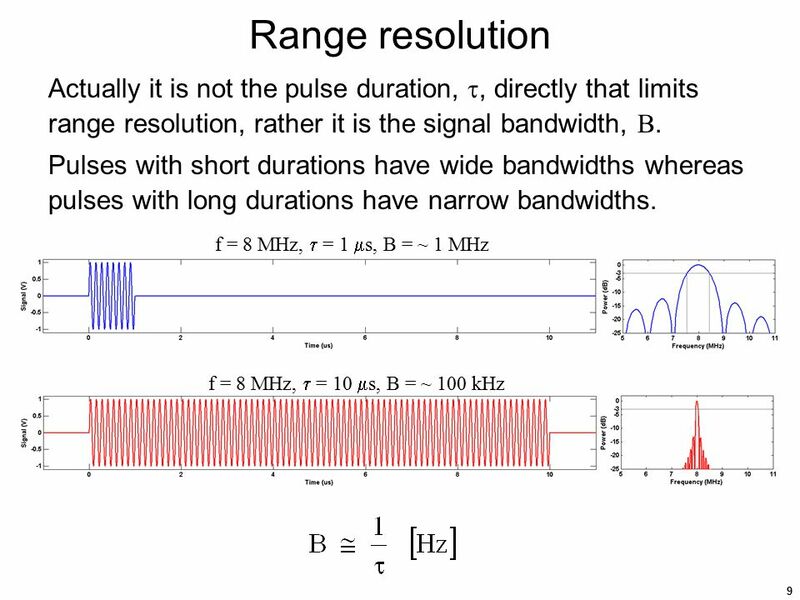 Other techniques for accommodating a large signal dynamic range involve pulse compression and digital signal processing, topics yet to be covered. 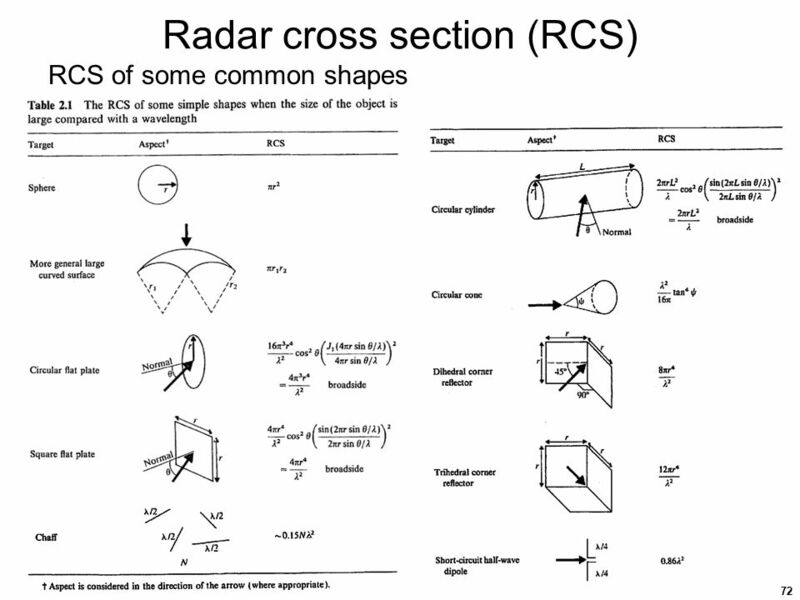 An object’s RCS depends on the characteristics of the object (size, materials, geometry) and of the radar (frequency, polarization, orientation) Consider the simple sphere The RCS of a sphere is complex (although it is independent of orientation due to its symmetry) If the circumference is much larger than the wavelength (2r » ) then RCS ≈ physical cross sectional area (r2)  reflectivity (r, r) [called the optical region] If the circumference is comparable to the wavelength (2r  ) then RCS fluctuates with variations in size or wavelength [called the Mie region or resonance region] If the circumference is much smaller than a wavelength (2r « ) then the RCS  (r/)4 [called the Rayleigh region] This explains why radars don’t typically ‘see’ air molecules and why the sky is blue. 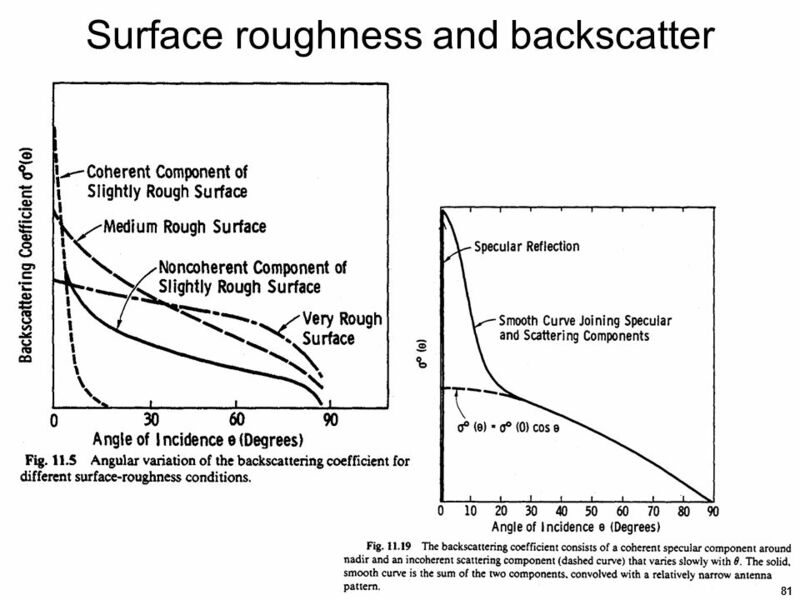 The electrical properties of materials determine the reflection properties. 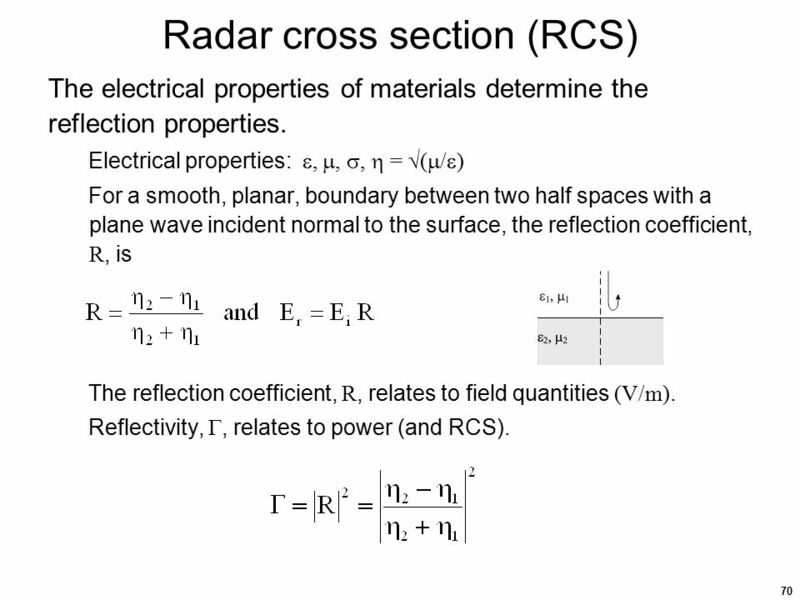 Electrical properties: , , ,  = (/) For a smooth, planar, boundary between two half spaces with a plane wave incident normal to the surface, the reflection coefficient, R, is The reflection coefficient, R, relates to field quantities (V/m). 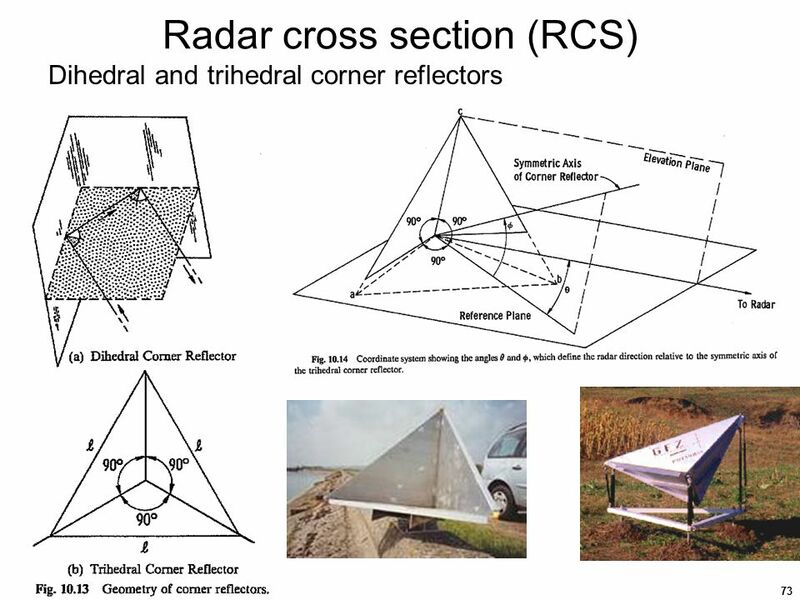 Reflectivity, , relates to power (and RCS). 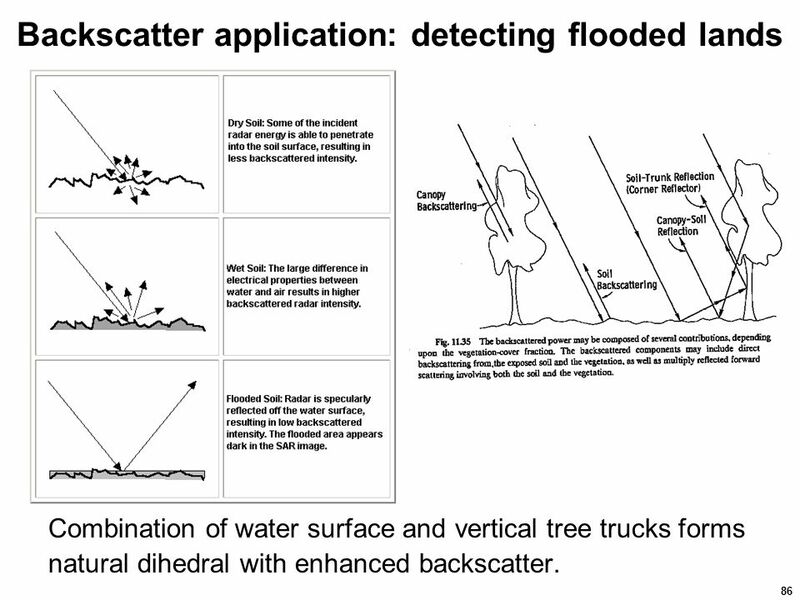 Combination of water surface and vertical tree trucks forms natural dihedral with enhanced backscatter. 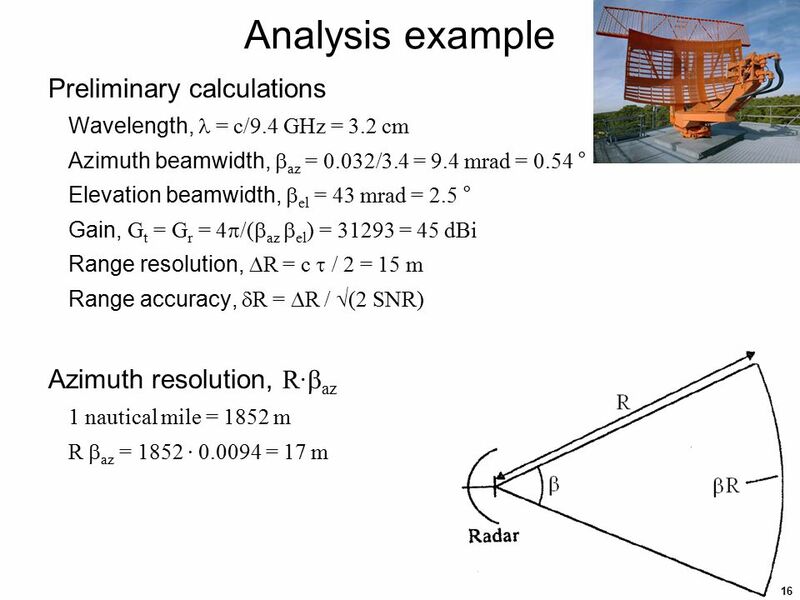 The area of illumination to be used in the analysis is dependent on the system characteristics. 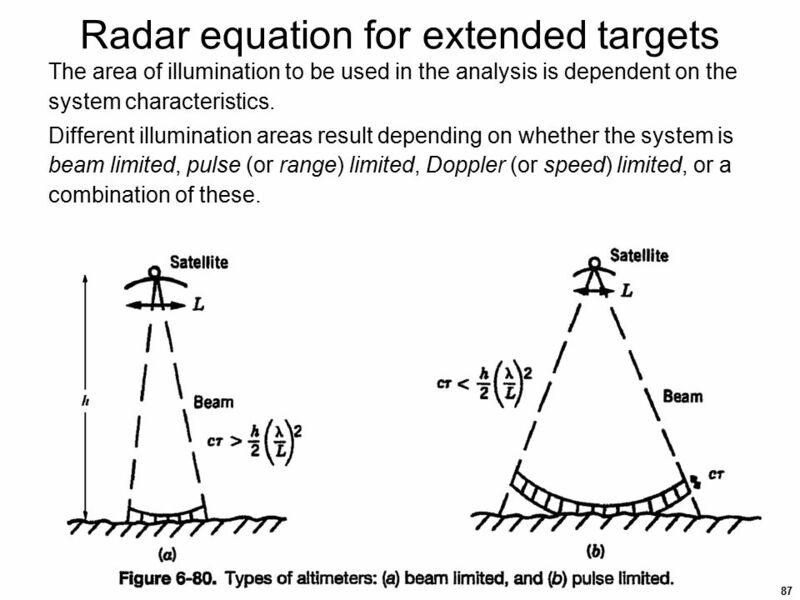 Different illumination areas result depending on whether the system is beam limited, pulse (or range) limited, Doppler (or speed) limited, or a combination of these. 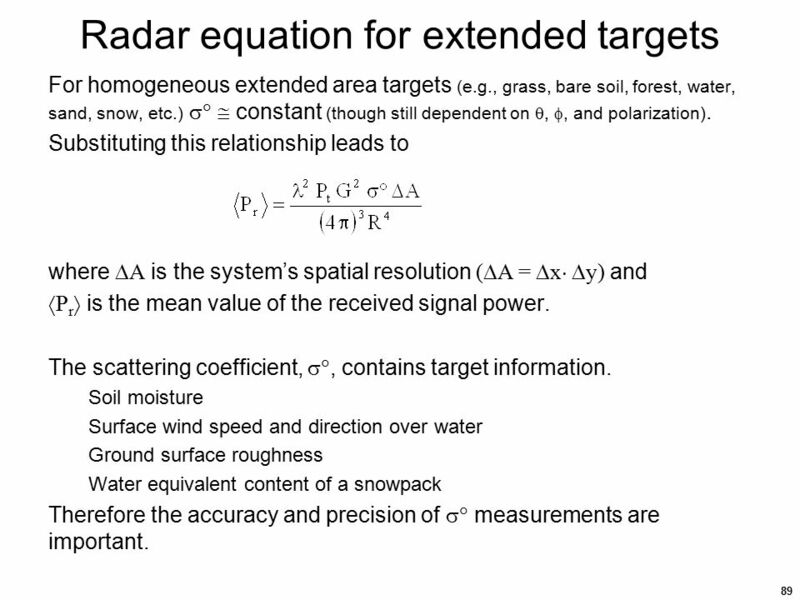 For homogeneous extended area targets (e.g., grass, bare soil, forest, water, sand, snow, etc.) 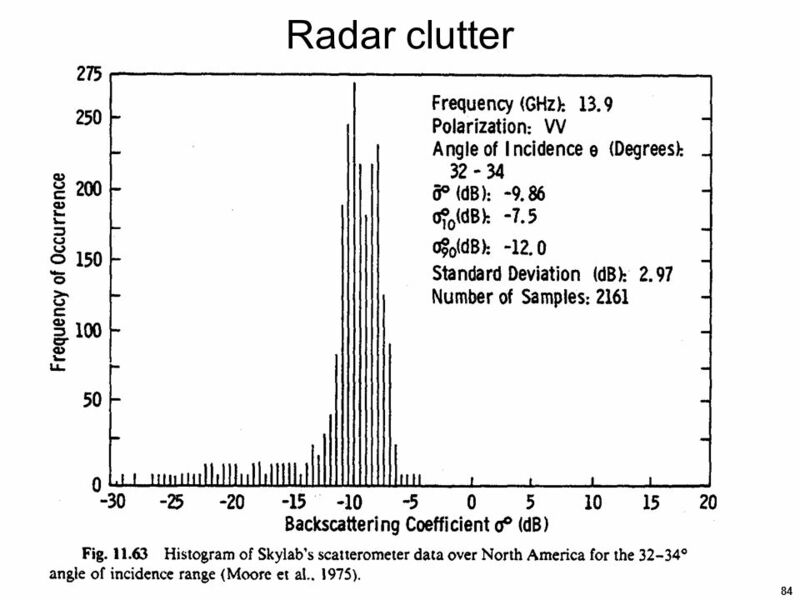   constant (though still dependent on , , and polarization). 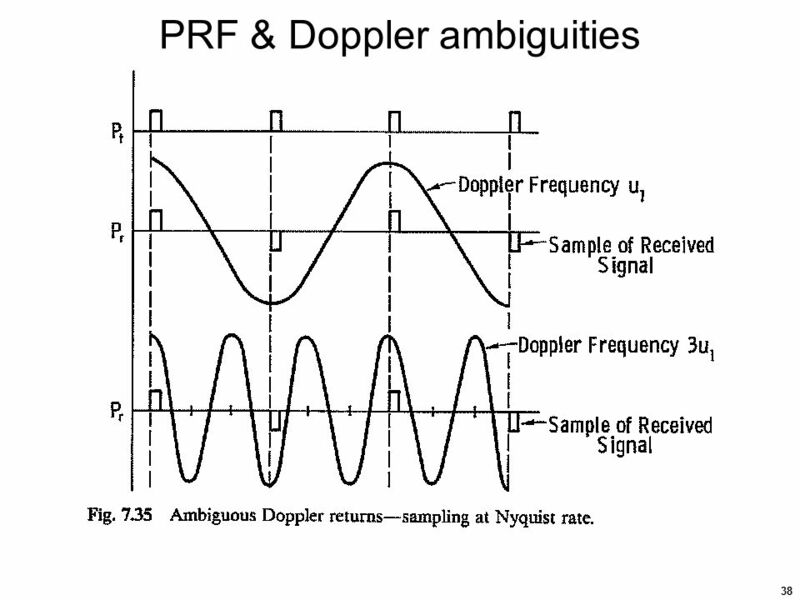 Substituting this relationship leads to where A is the system’s spatial resolution (A = x y) and Pr is the mean value of the received signal power. 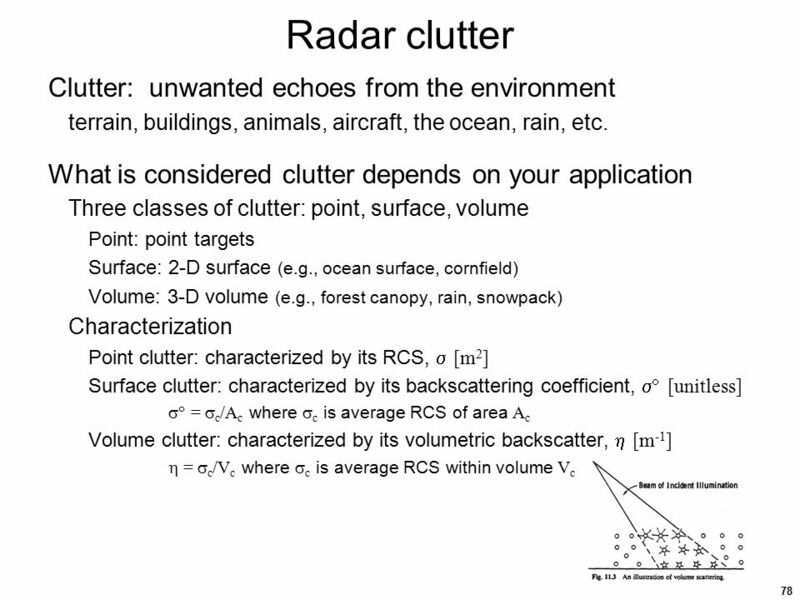 The scattering coefficient, , contains target information. 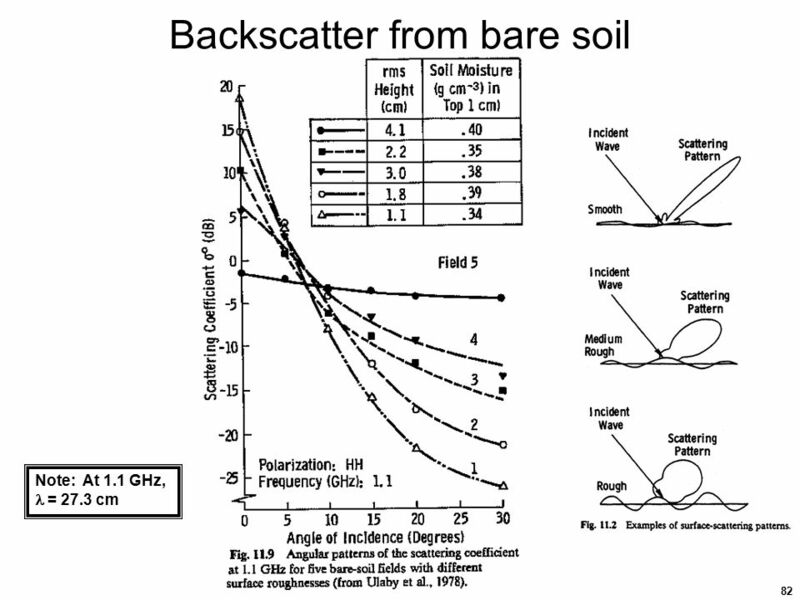 Soil moisture Surface wind speed and direction over water Ground surface roughness Water equivalent content of a snowpack Therefore the accuracy and precision of  measurements are important. 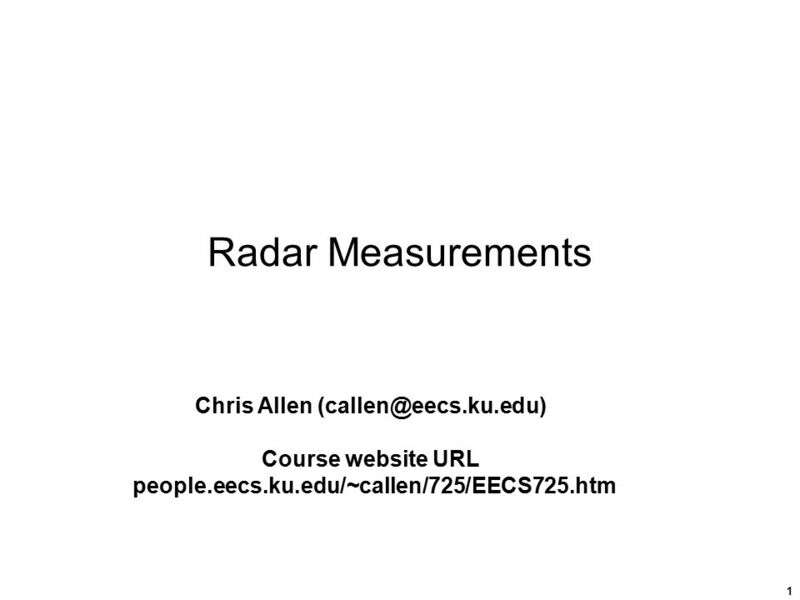 Download ppt "Radar Measurements Chris Allen"
1 Small-scale Mobile radio propagation Small-scale Mobile radio propagation l Small scale propagation implies signal quality in a short distance or time. 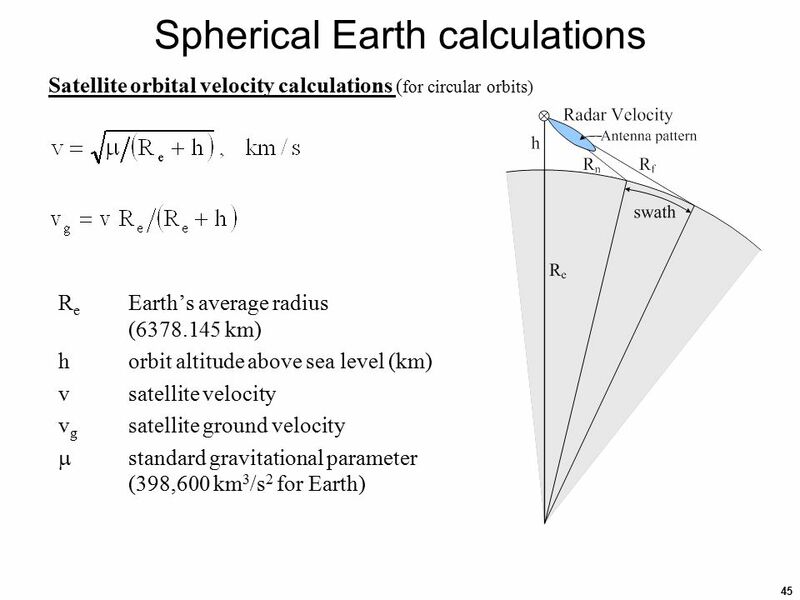 Motivation Application driven -- VoD, Information on Demand (WWW), education, telemedicine, videoconference, videophone Storage capacity Large capacity. 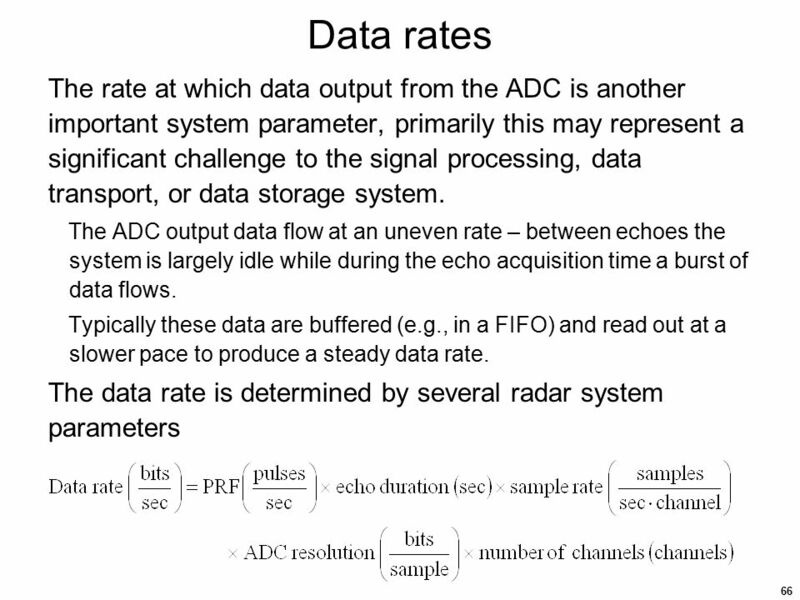 JF 12/04111 BSC Data Acquisition and Control Data Representation Computers use base 2, instead of base 10: Internally, information is represented by binary. 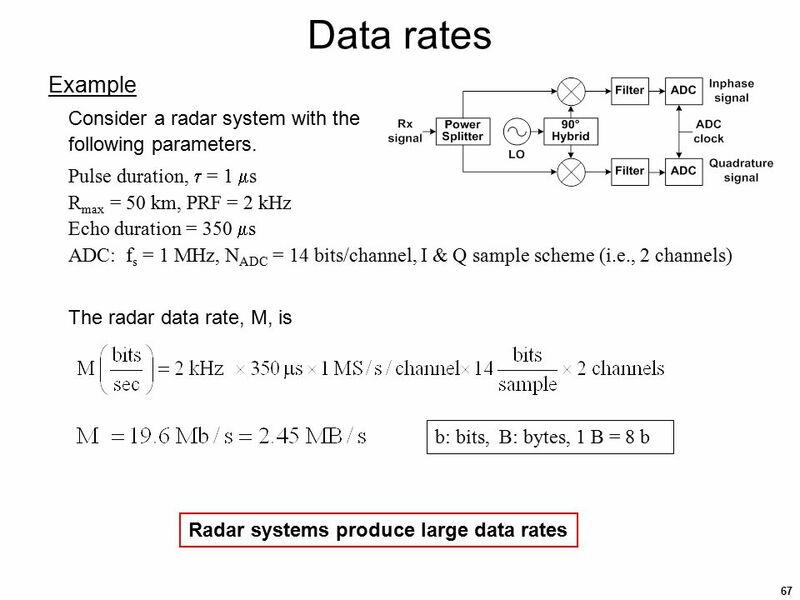 William Stallings Data and Computer Communications 7th Edition (Selected slides used for lectures at Bina Nusantara University) Data, Signal. 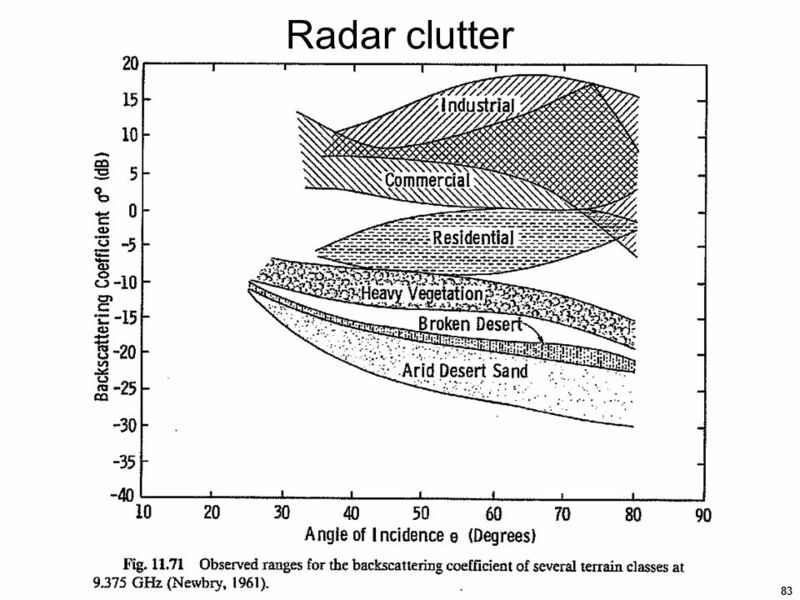 Your Name Your Title Your Organization (Line #1) Your Organization (Line #2) Week 4 Update Joe Hoatam Josh Merritt Aaron Nielsen.